DOWNLOAD the full Restoration.pdf version by clicking the images above. 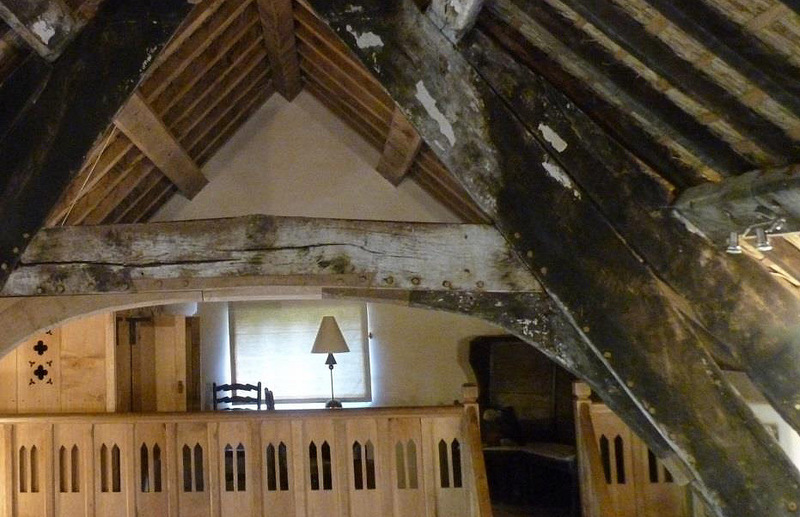 HACTON CRUCK is a medieval cruck-framed hall dating from the late C14th. 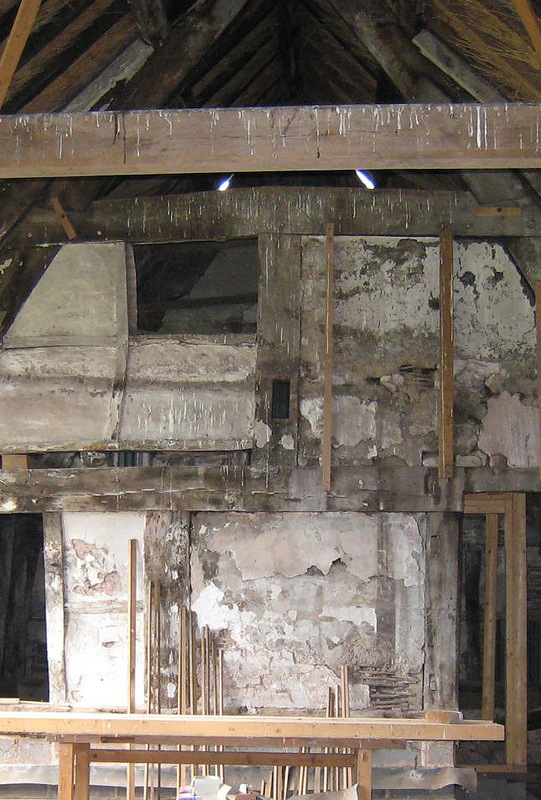 In the C16th or C17th a floor was inserted into the open hall. 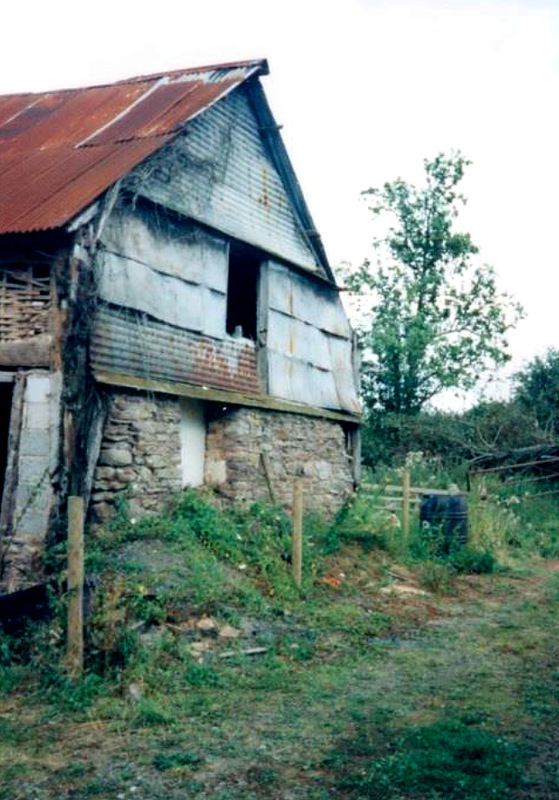 It was turned into two cottages in the C18th or C19th. By the early C20th it was no longer inhabited. 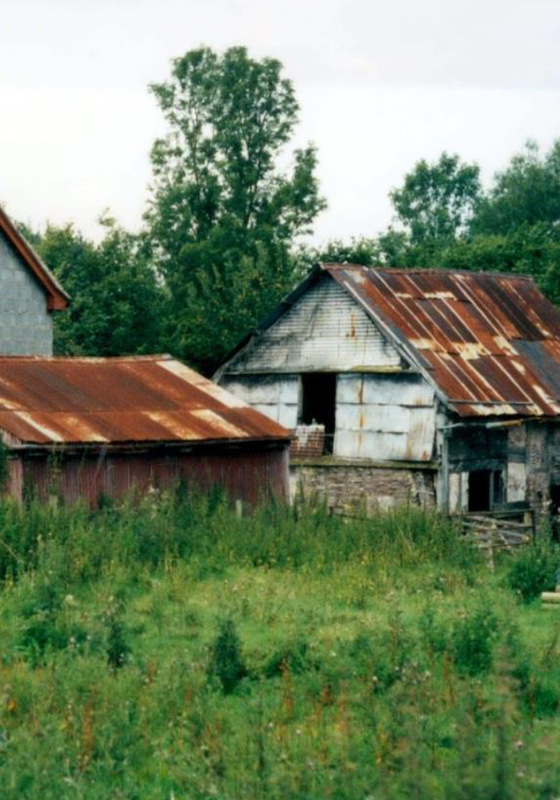 From then until the 1960s it was utilised for farm use, and apples and hay were stored there. Eventually it outlived that use too and was close to being lost altogether. It sits on the edge of modern day Preston-on-Wye. In the C11th the village of Preston-on-Wye was centred around the church. 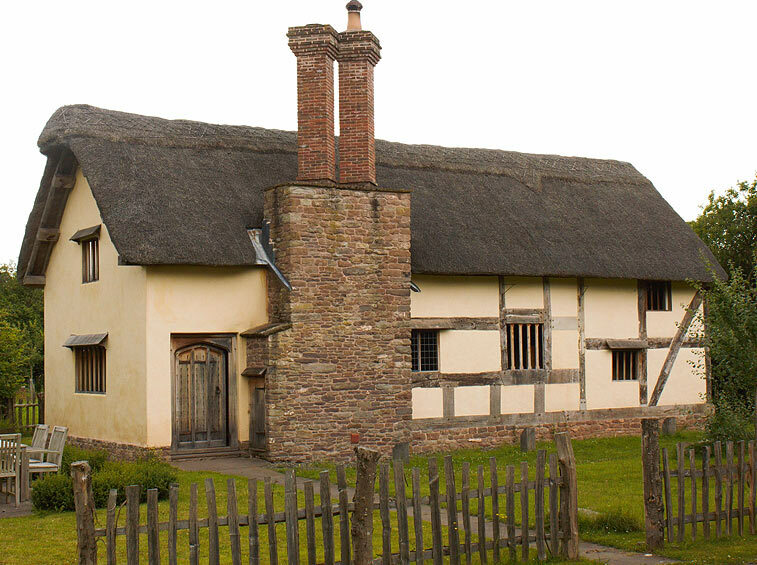 The borough of Ploughfield was a new settlement established by the bishops of Hereford half a mile to the south. Ploughfield was granted a charter by the king in 1235 and was described as a borough in 1273 when it had a bailiff, markets and fairs. By 1500 it appears to have ceased to be a small market town and, post-medieval, became a village or hamlet. 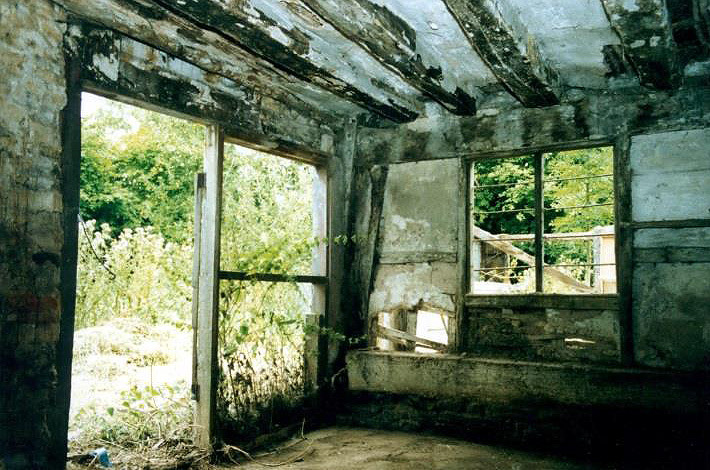 The date of the decline and virtual abandonment of the town is not known. 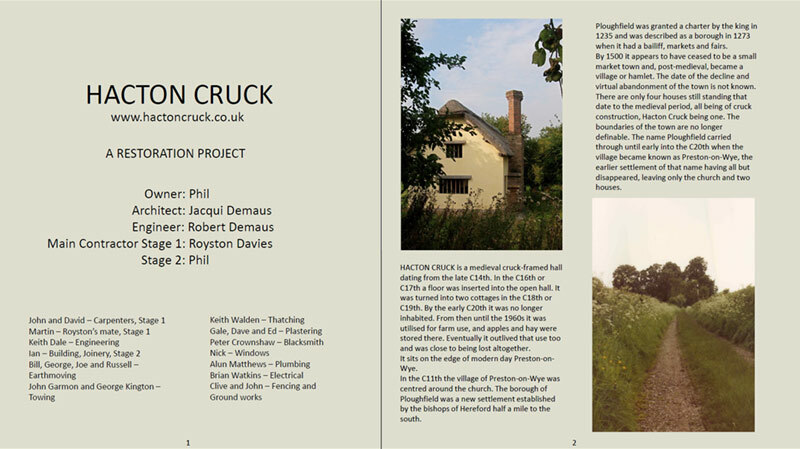 There are only four houses still standing that date to the medieval period, all being of cruck construction, Hacton Cruck being one. The boundaries of the town are no longer definable. 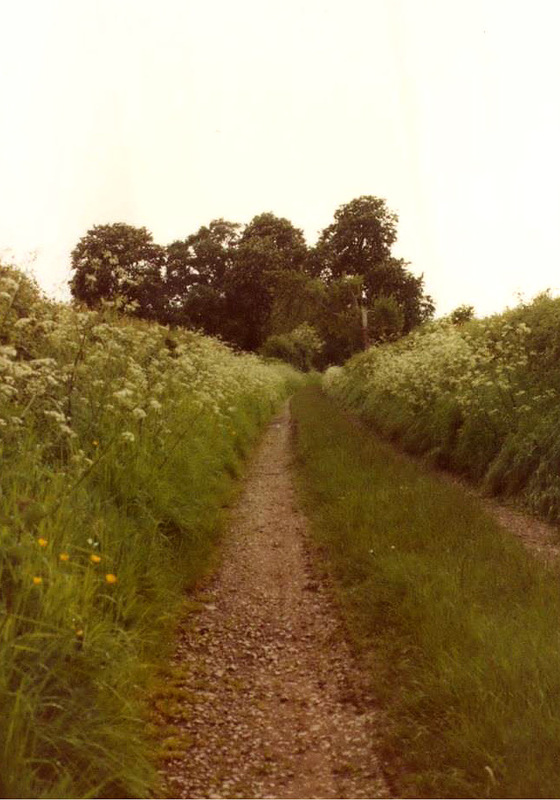 The name Ploughfield carried through until early into the C20th when the village became known as Preston-on-Wye, the earlier settlement of that name having all but disappeared, leaving only the church and two houses. 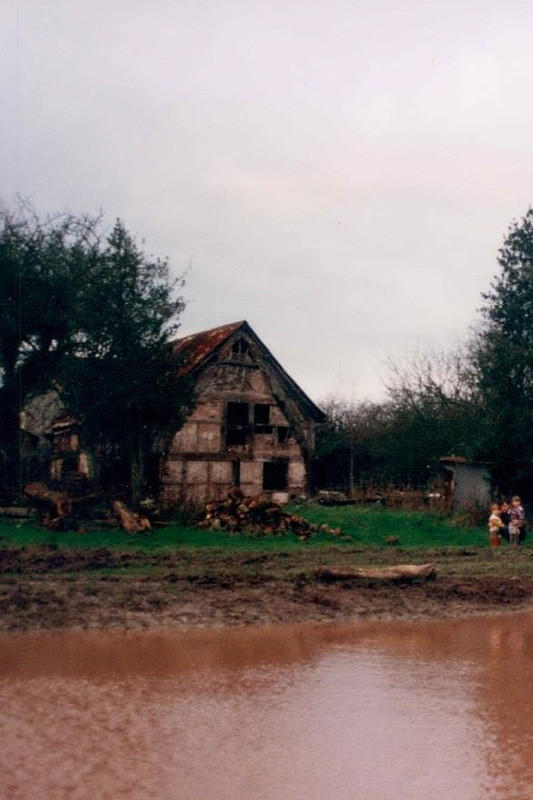 When I was a child the cruck was owned by my grandfather and we used to play there occasionally. It was in better condition then; roof and gutters kept the building dry, doors opened and shut, the stairs and upstairs floors were sound, the ceilings intact. An old family friend and amateur historian used to get excited about it, so when it came into our ownership I decided to look at how to save it. 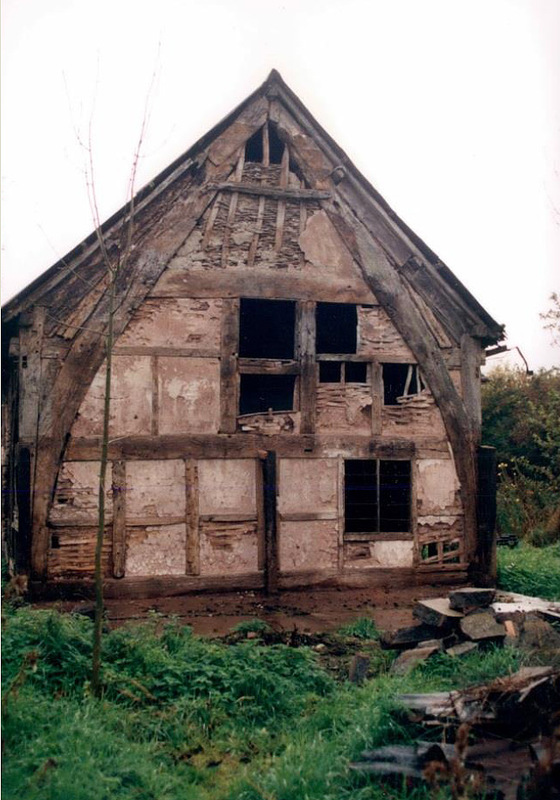 When Hacton Cruck came into my possession the roof was off the north-east corner; the floor was collapsing; ivy was eating away the panels in the north end; gutters were gone and water ran down the walls and pooled inside the building. 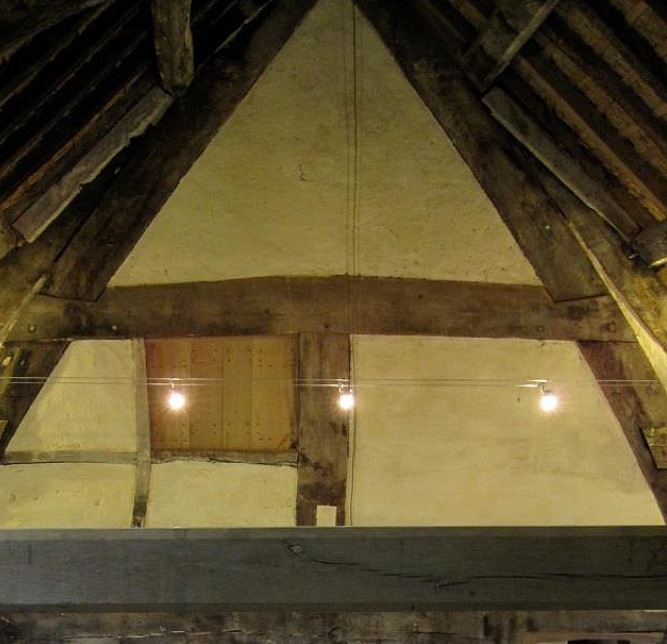 At least one of the original bays had been lost and the centre bay truss, once the middle of the medieval hall, formed the southern end of our building. It was sitting four feet from the neighbour’s boundary. 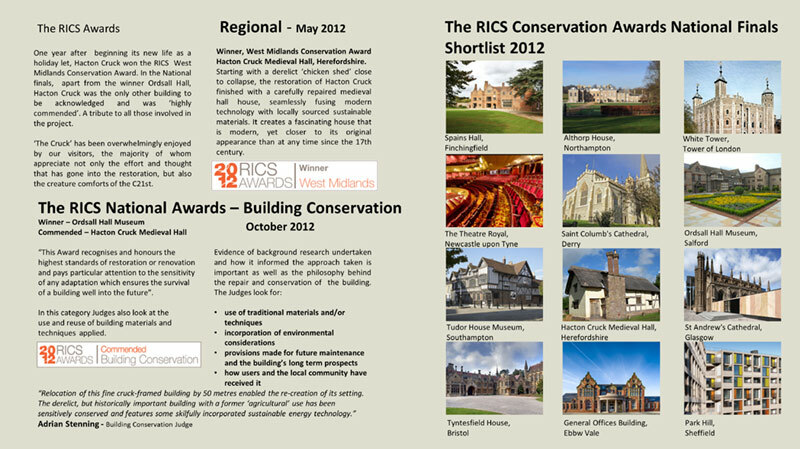 With our architect we looked at various options as to how to go about the restoration. However it was looked at, if we wanted to reinstate the hall it would be necessary to move the building in order to rebuild the missing bay. And so began the restoration project. 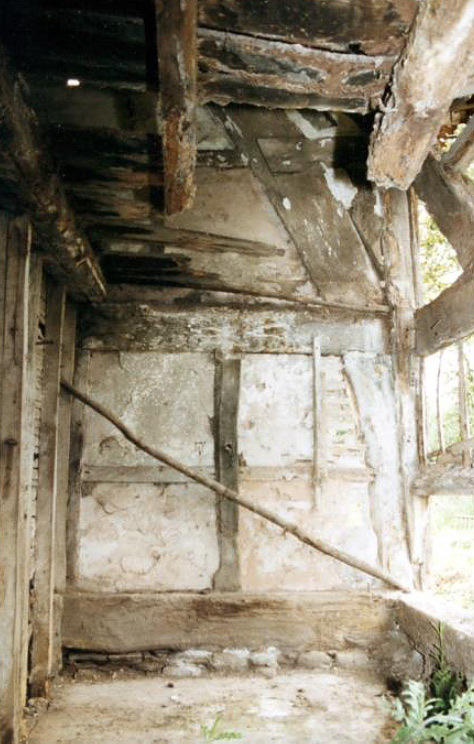 Medieval cruck-framed halls generally followed the same layout. At the ‘high’ end, the owner’s private rooms. In the next two bays, the communal open hall. Here, family, servants and retainers took meals and entertainment together; at the lower end of the hall a cross passage screened the two opposing entrance doors. 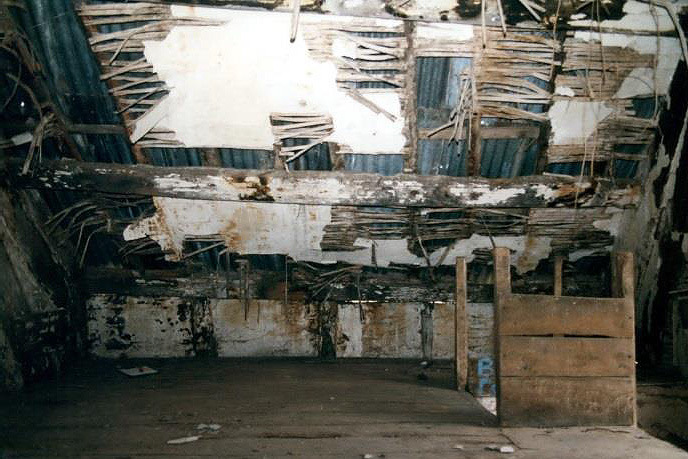 Often there was a fourth bay of service rooms where food and drink were stored and prepared, though possibly Hacton only ever had the three bays. 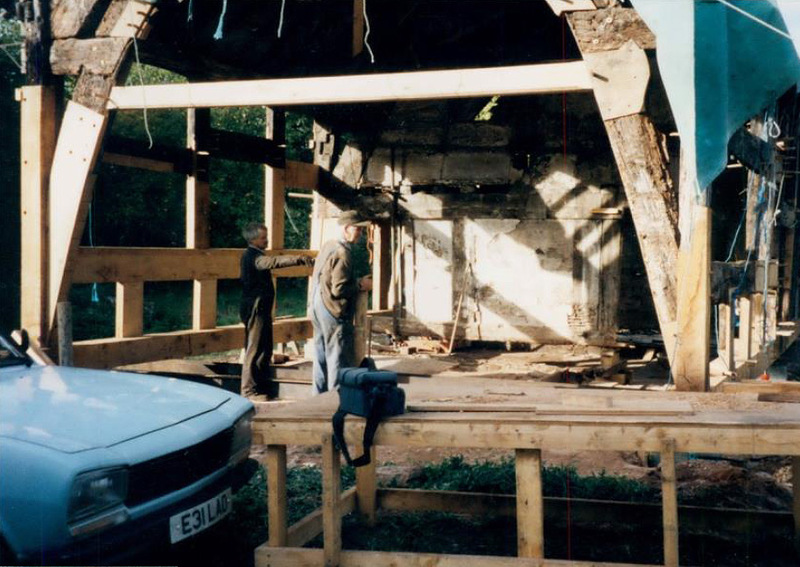 As it stood we only had the first two of those bays, up to the centre bay truss. For its time, (late C14th to early C15th), it would have been a building of some importance, perhaps owned by a prosperous yeoman farmer or man of similar standing. 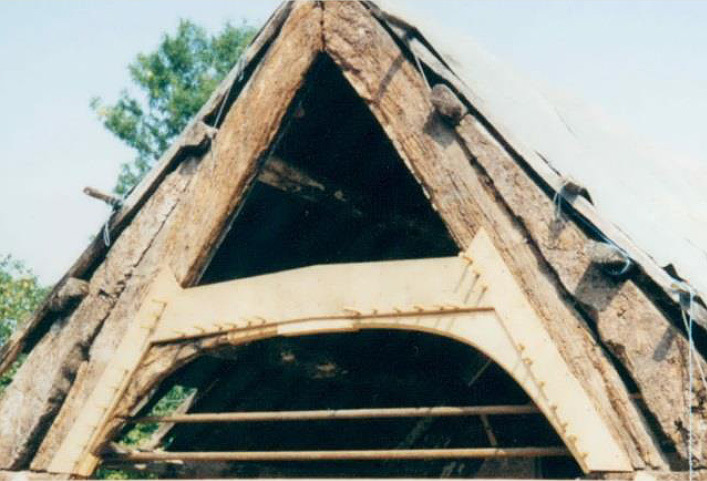 The cruck frame as a method of construction was widely used in the West Midlands in Medieval times. A single tree or large limb would be cut down the middle, trimmed, and opened out to form a matching pair of cruck blades. 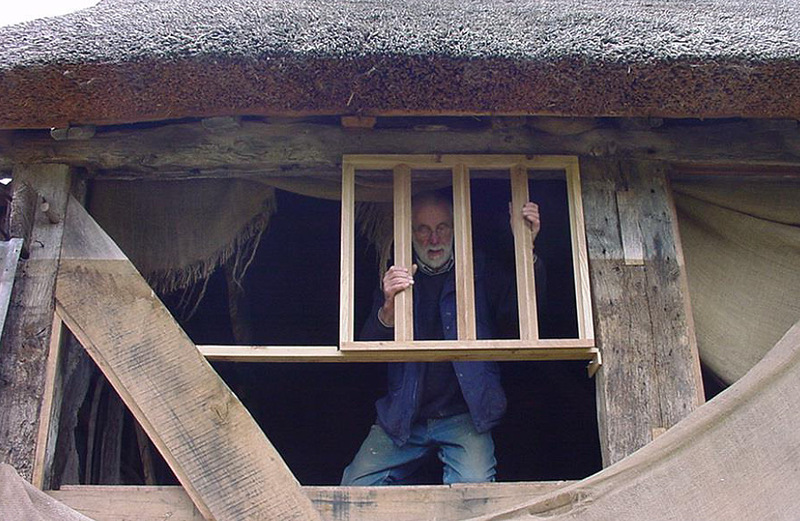 For a three-bay building, four pairs of similar sized crucks would be needed. Hacton had three pairs remaining. 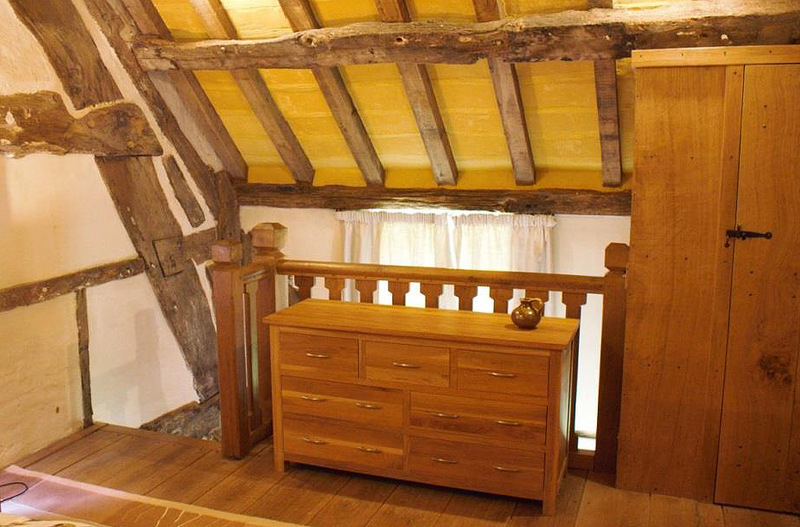 The Cruck was not listed, having been overlooked in a nationwide survey of buildings and structures in the 1980s. Our architect, Jacqui Demaus, felt that since the building was outside of the village envelope, our chances of gaining planning consent would be improved if it was first listed. This being achieved, the planning application was filed. It was something of a risk as the moving of a listed building was likely to prove contentious. And so it turned out. 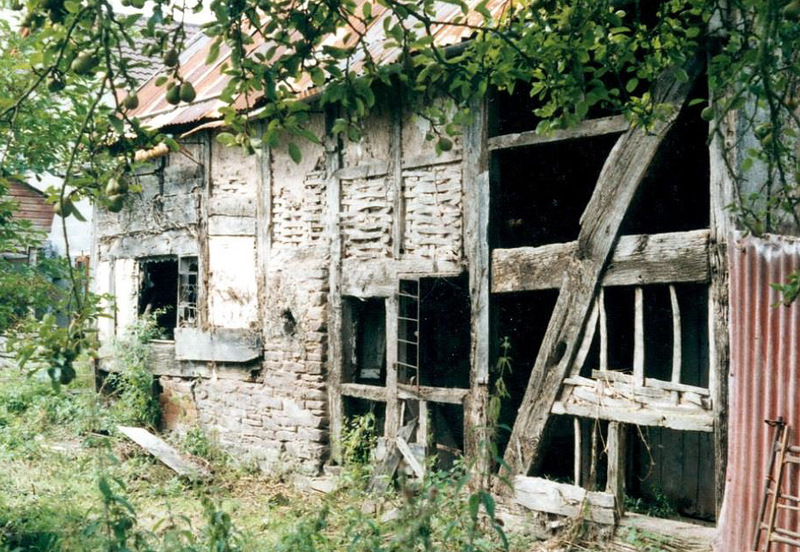 The Society for the Preservation of Ancient Buildings (SPAB), the Archaeological Society, and the planning department opposed the application. In support were English Heritage, the local Conservation Officer and local councillor. With planning approval finally passed the next decision was as to how best move the building. Should it be dismantled or should we take the more unusual course of trying to move it in one piece; it was, after all, only 50 yards to its new site. Three specialist companies were asked to tender for the job. Two of them proposed to dismantle the building. 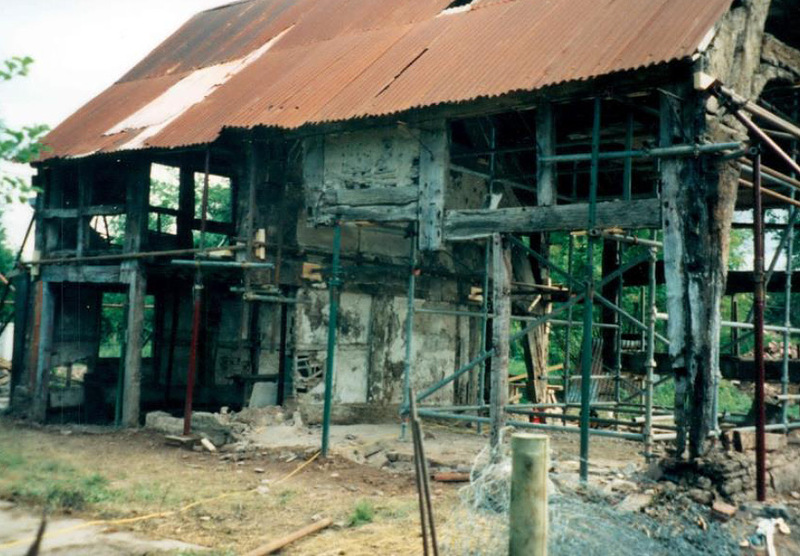 Robert Demaus (husband to architect), our engineer, firmly believed that much more of the building could be retained if it was repaired in situ and dragged to its new site. To that end he set about doing a thorough survey of the structure and drawing up a repair schedule. 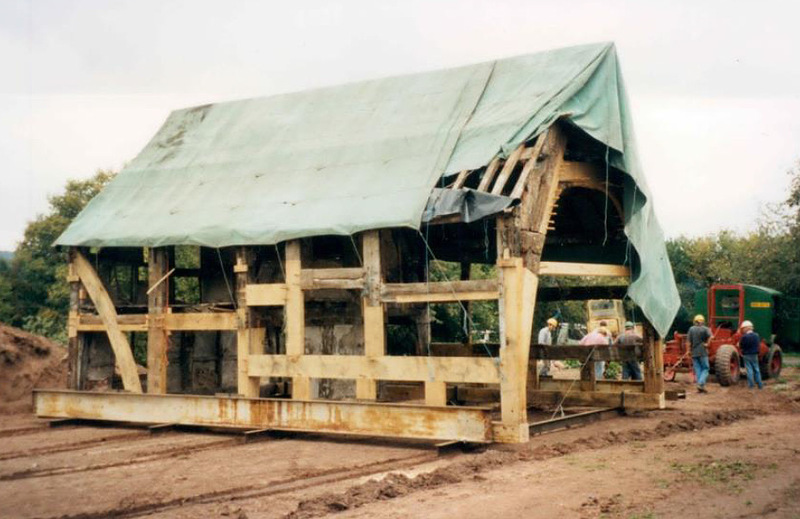 Royston and his team were entrusted with the job of repairing and moving the frame and building the shell of the third bay. The roof had been put back on, but not before the first floor in the north-east corner had collapsed and panels disintegrated. 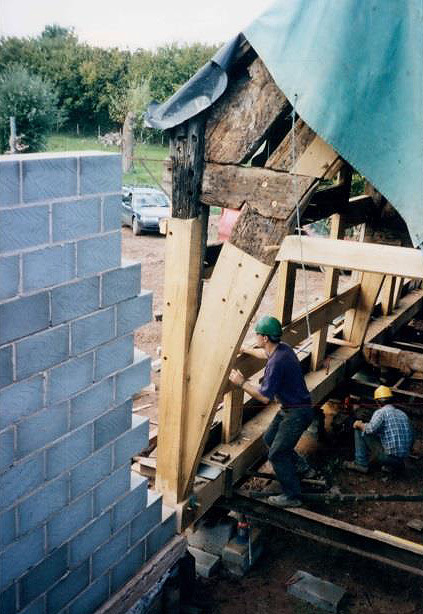 On the right of the building is the arch brace, running diagonally from the bottom plate to the top of the wall post. The loss of the opposing brace in the missing end bay could account for the heavy lean to the north. 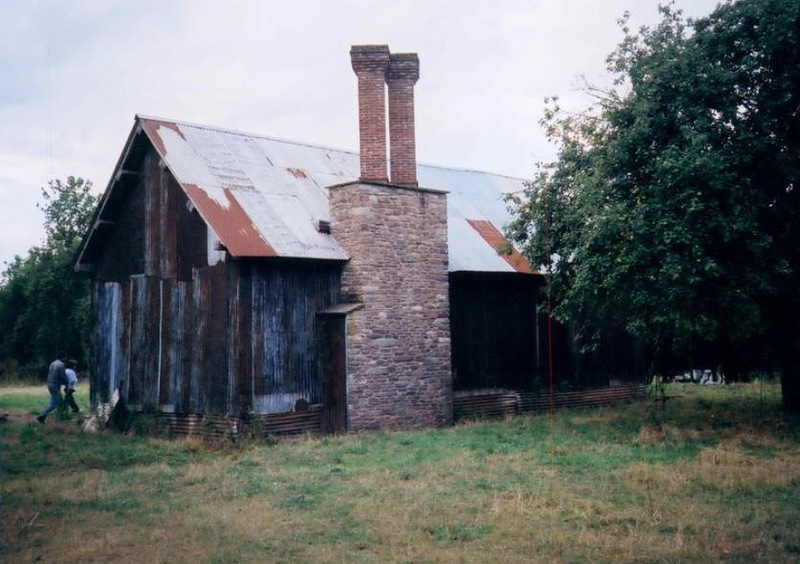 The north elevation was least affected by the weather owing to the protection afforded by the attached lean-to (a pig used to be kept there) and weatherboarding above. 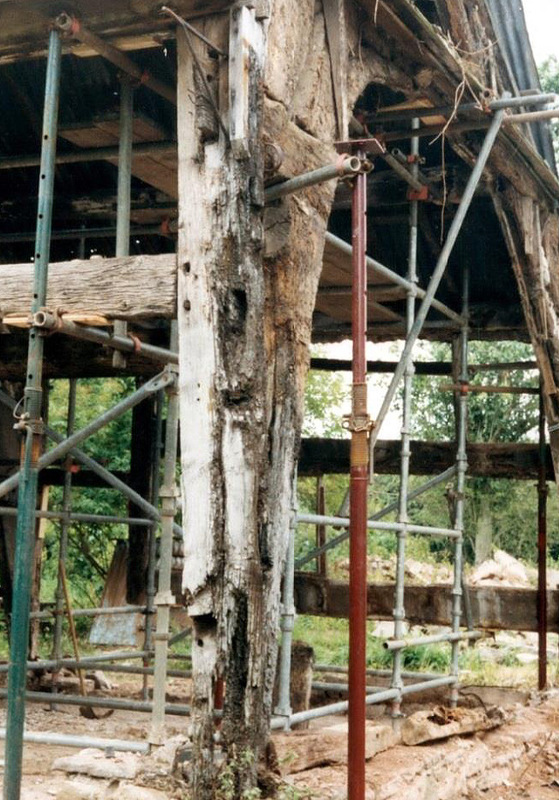 Although the weather had been kept at bay ivy had penetrated beneath the boards damaging daub and plaster, so although the majority of panels were able to be repaired, others were not. The large triangular panel at the top was the only one thought to be original. 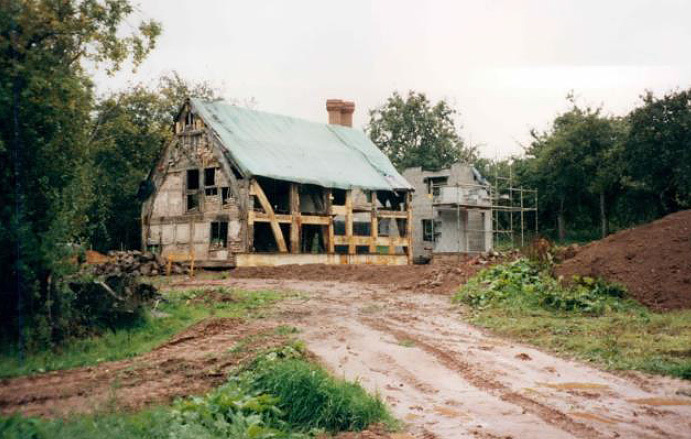 With its conversion to two cottages in the C18th/C19th two new entrances were created. Stonework, housing two fireplaces, was built in between. 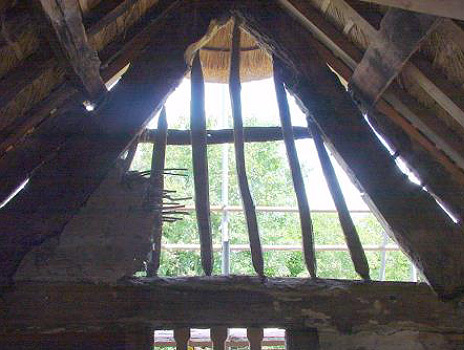 This resulted in the loss of much of the timber framing up to head height in the west wall. 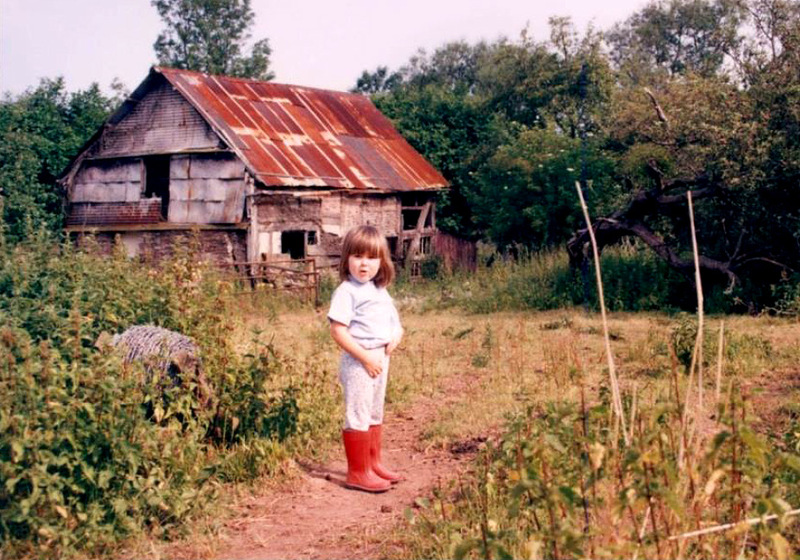 The cottage to the north was used to house chickens when I was a child. Visible is all that remains of the arch brace on this side of the building, a small section of it running through the horizontal member over the wired door. 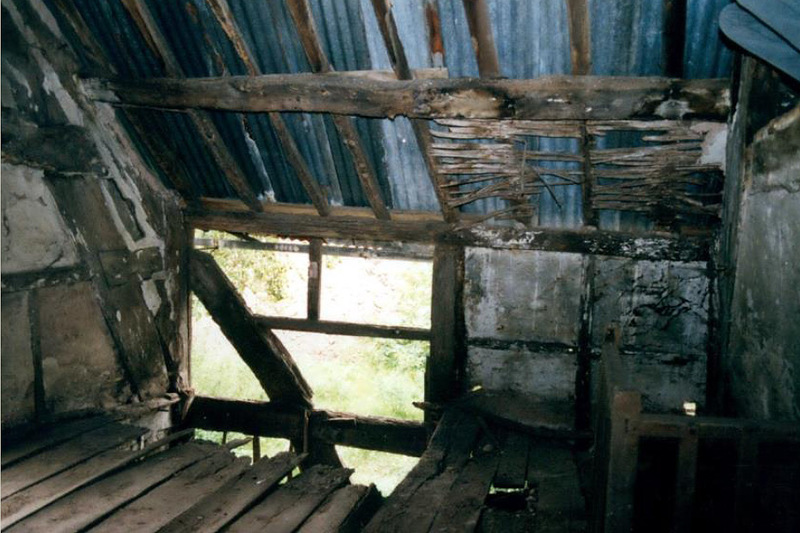 No evidence of chimneys remain and the smoke-blackened timbers of the inserted floor suggest there never were any. 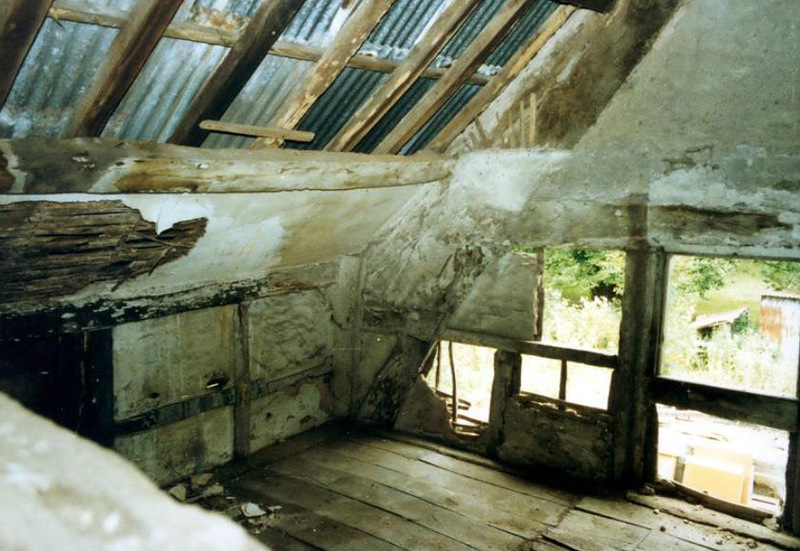 The following three pictures are of the same room, the front room of the cottage to the north. 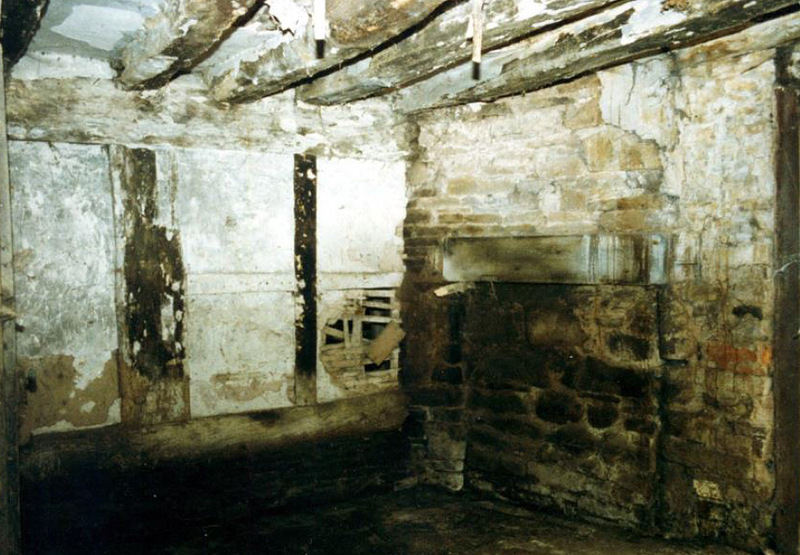 Originally this was the parlour, the private room on the ground floor beyond the open hall. It is now the downstairs bedroom. 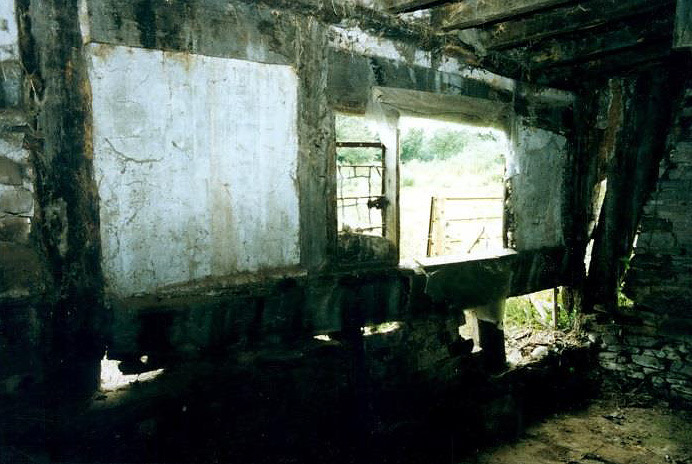 Fixed leaded panes filled the window opening so it was of no use for ventilation. 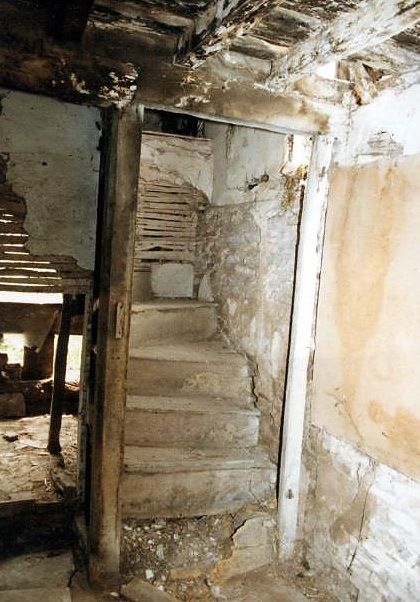 The boxed in stair would have been a later alteration as it partially obscured the original doorway between the hall and parlour. 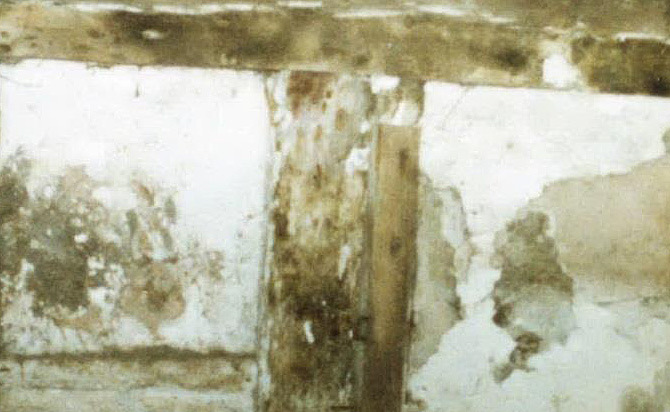 There were remnants of coloured limewash behind the framing attached to the cross wall. 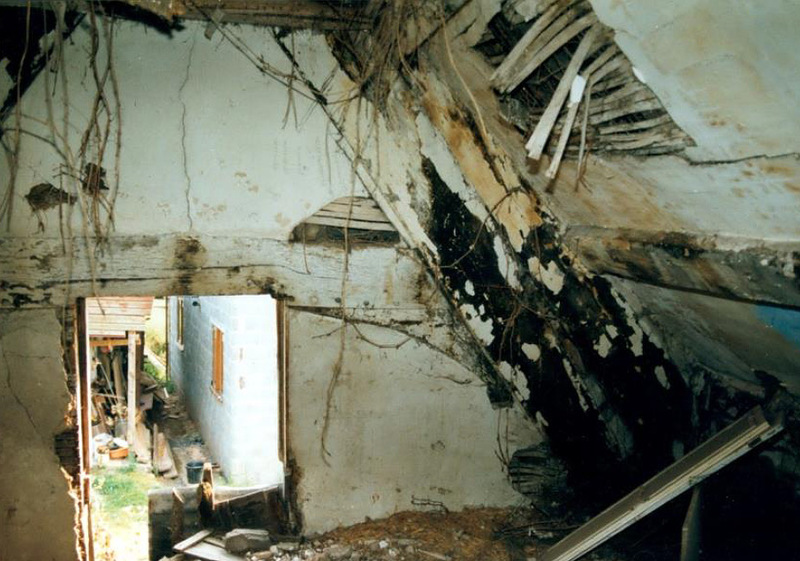 In good condition when I was a child, the stair was no longer safe after the roof leaked above it. 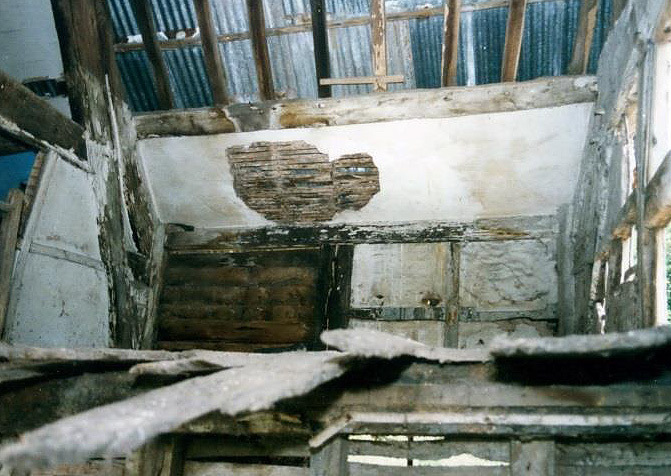 In spite of water collapsing the floor in the north-east corner, the adjoining wall remained in reasonable condition. 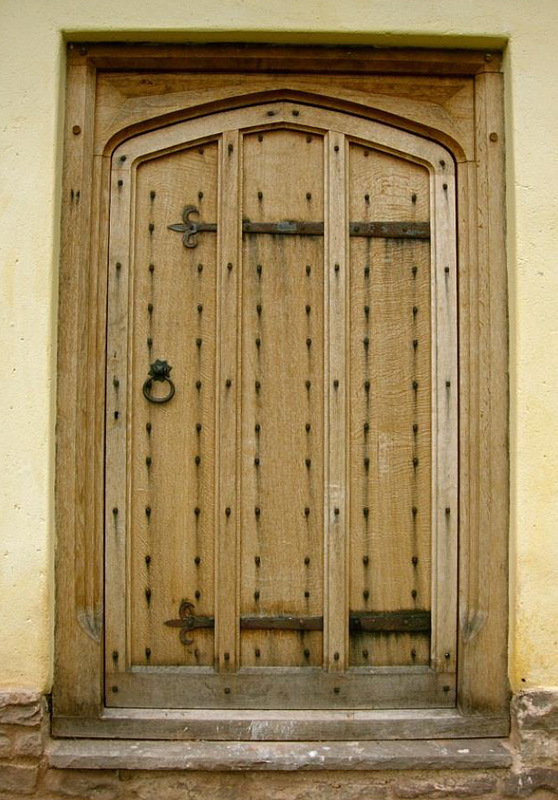 The four ground-floor panels would have been a single large panel when built in the C14th and was later split; the vertical piece of timber was second hand when put in as it shows a stop chamfer. The new bathroom window is located in the top left hand panel. The new stairs is to the right of it, against the wall. The head of the stair ending at a void. 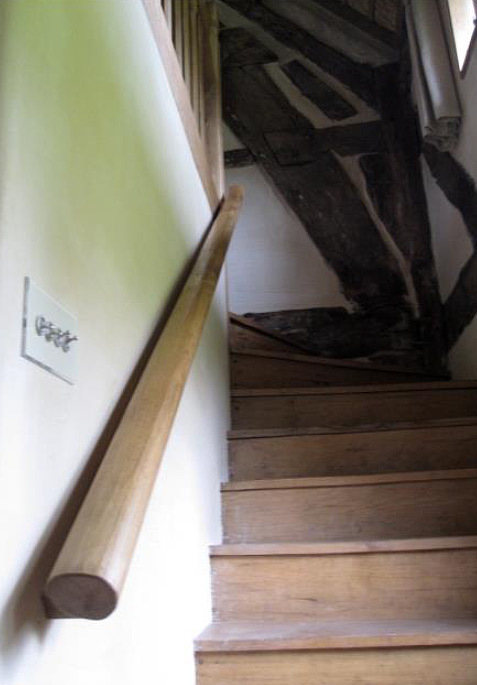 The staircase would have had to be moved in any case as it was partially blocking the doorway through to the hall. 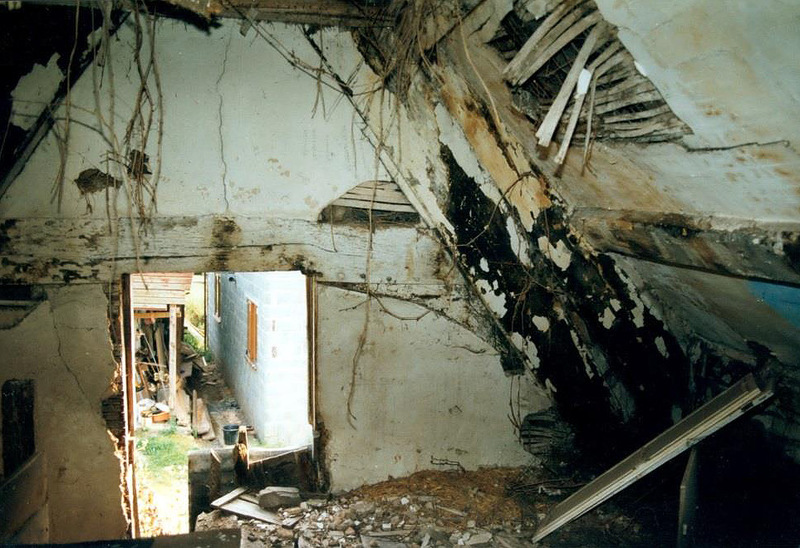 As a result of the water damage to the corner of the solar, some of the rafters, the floor boards and most of the joists weren’t salvageable. It was the only part of the building that was beyond repair. It created an obvious route for the new staircase. The solar, looking north-west. 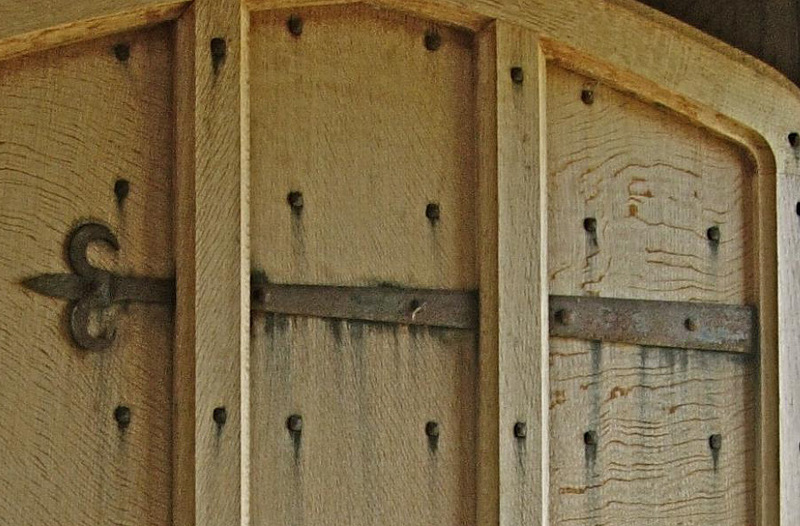 The square opening in the right of the picture has wide mortice holes (not visible) for window mullions. 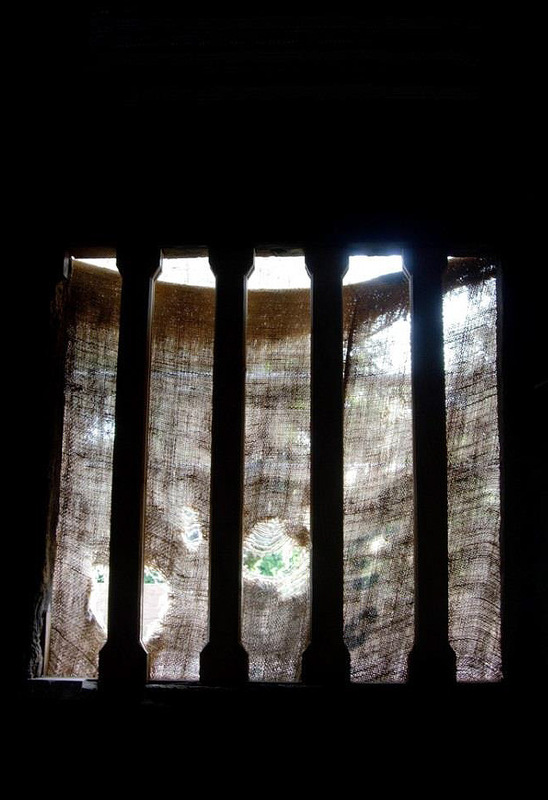 This would have been the only window in the room; with no glazing and, facing due north, it must have been bitingly cold in winter. Looking [above] into the hall from the solar. 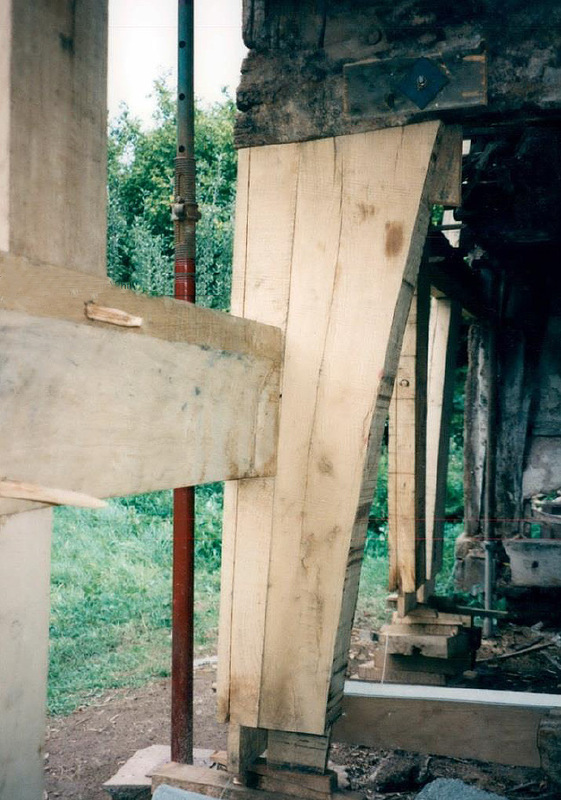 The large panel, broken into four with an opening, is divided using poplar, otherwise all structural timber is oak excepting some of the floor joists. Where large panels have been subdivided this would have been a later alteration. 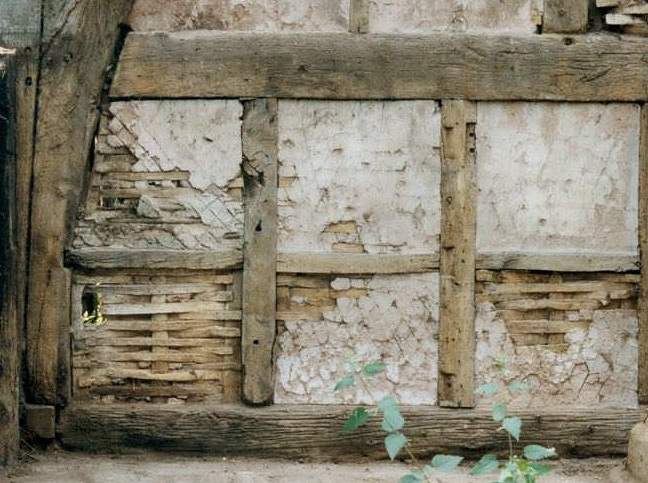 The smaller panels were all of lime plaster over oak laths. 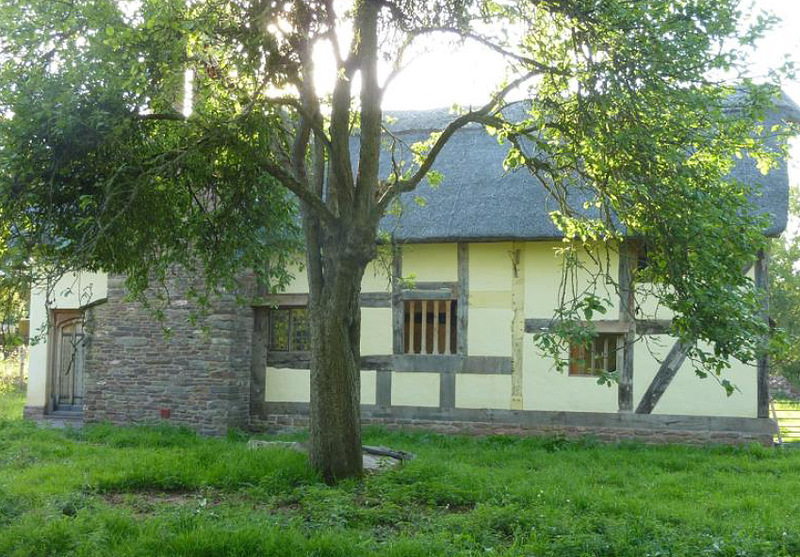 The remaining original undivided panels are all of daub over woven hazel. 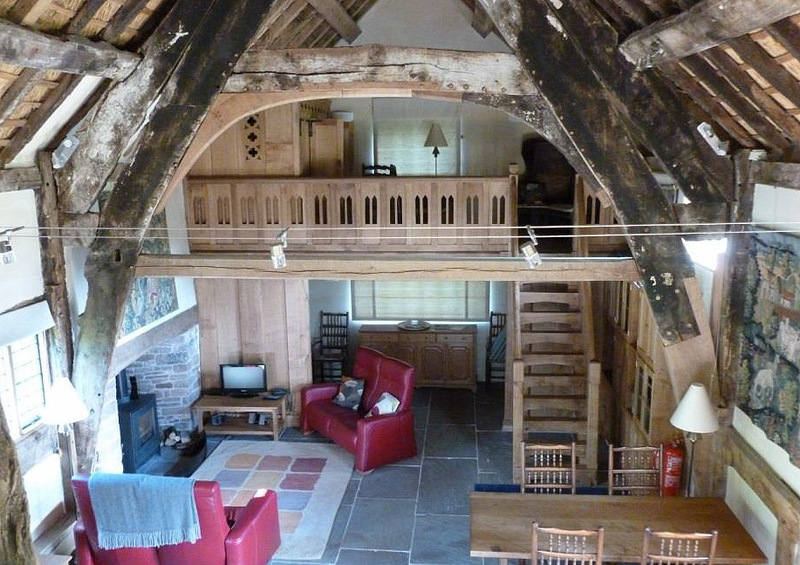 This is the front room of the cottage to the south. In spite of there no longer being a fire in the centre of the floor the beams are still so heavily smoke blackened it must bring into question whether the fireplace did have a chimney flue. The floor is a mix of broken flagstones, bricks and cobbles. 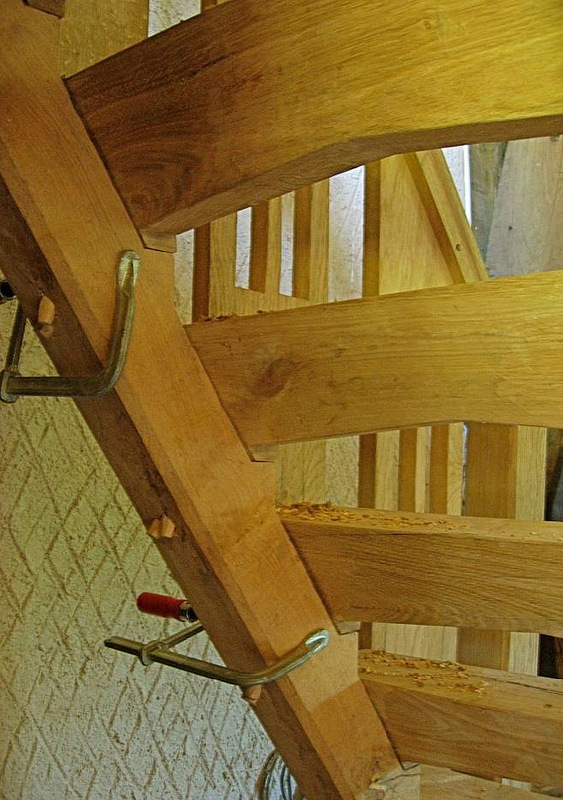 The elm stairs set against the stone infill wall of the centre bay truss. 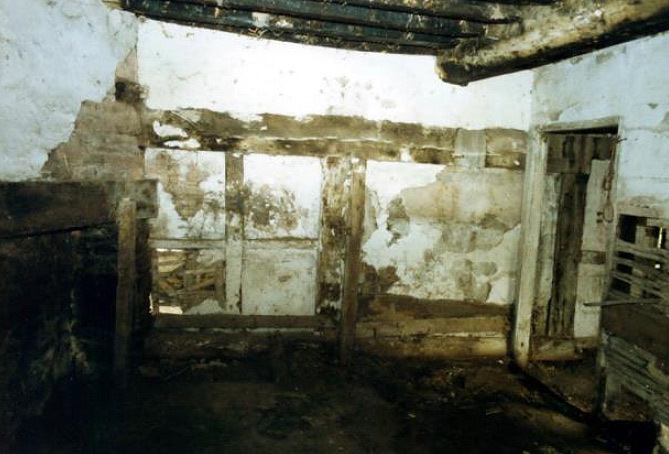 The ground floor of each of the cottages was divided into two rooms with a simple stud partition. 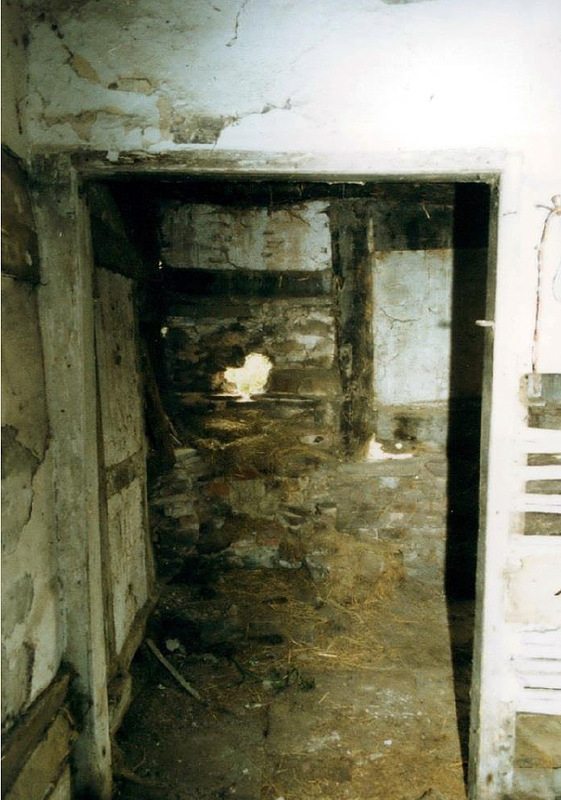 Originally the high end of the open hall, the position of the door between hall and parlour can be seen through the opening in the stud wall. 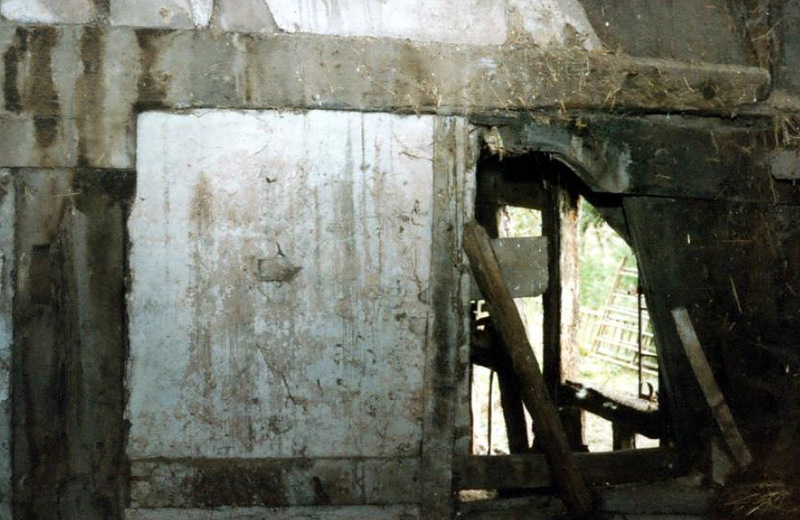 Unfortunately only a remnant of the moulding, worked into the door head between the hall and parlour, survived. 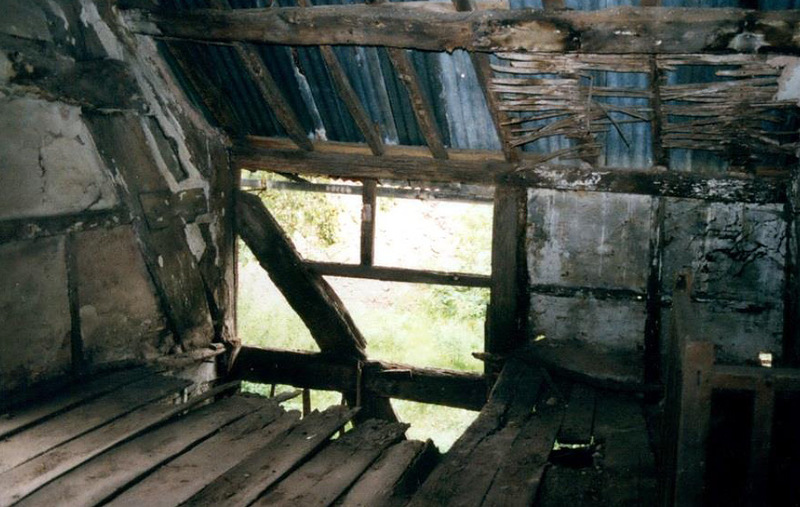 This represented the only embellishment, apart from the very basic chamfer and knees on the centre bay truss. The door would have opened out of the hall, but limitations of space led to us having to open it into the hall. Above. 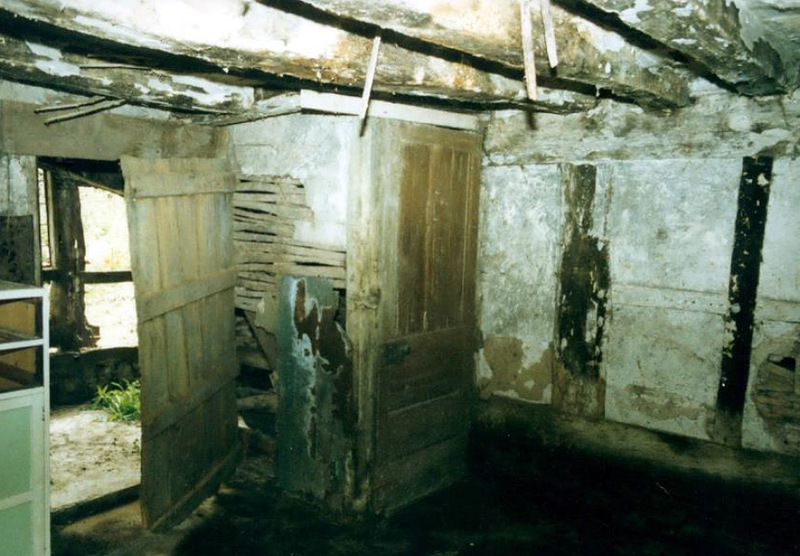 The back room of the cottage to the south. 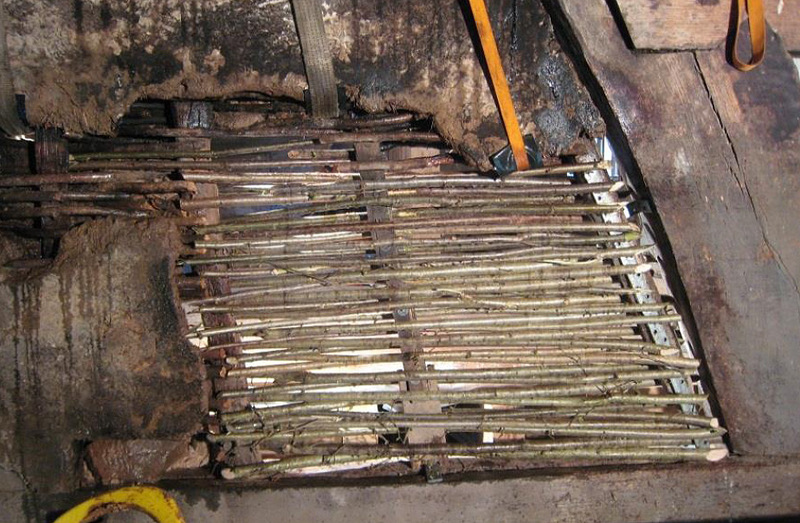 A copper sat on a brick stand that housed a fire below. 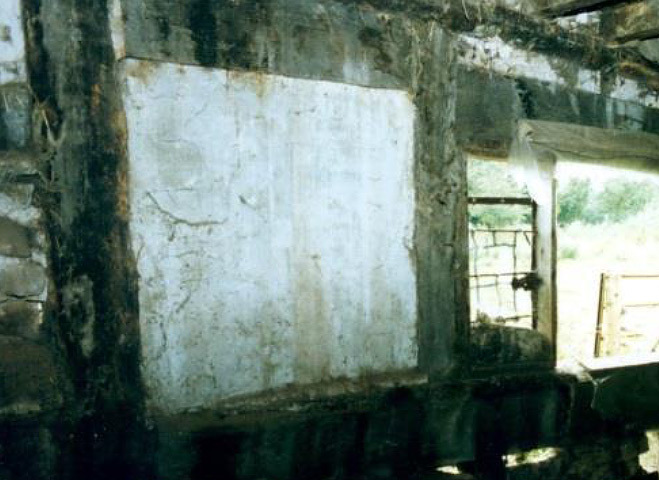 Although the hole visible goes to the outside, smoke funnelled up through a hole in the wall panel to the room above. Above. The same little back room had a leaded opening casement, in spite of which the floor joists still had a coating of the same tarry deposit. 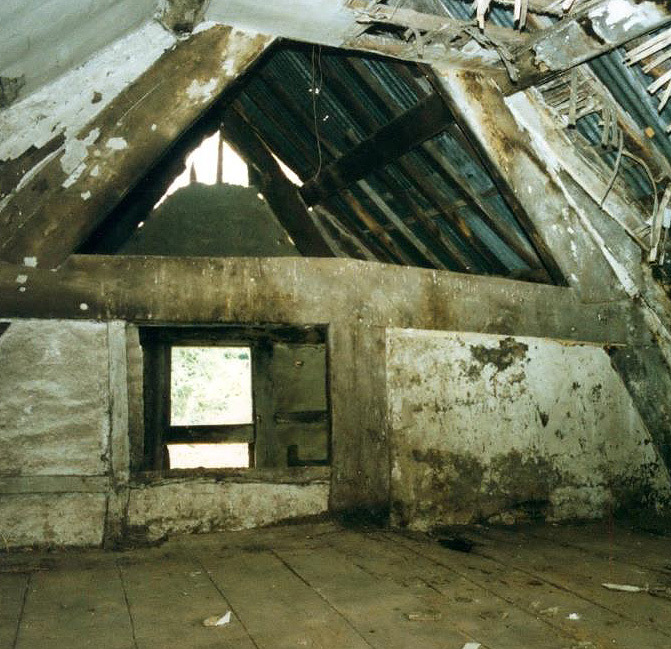 As in most all hall houses, in the process of modernisation a first floor was later inserted. 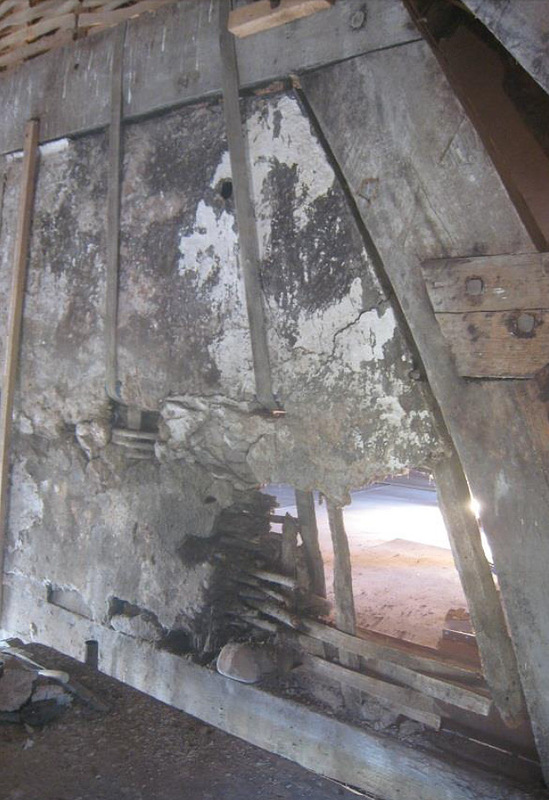 The very heavy chamfer to the beam dates this as having occurred in the late C16th early C17th. Usually, one would have expected this to coincide with the building of a fireplace and, a chimney. With the degree of smoke blackening we have, the chimney assumption has to be in doubt. 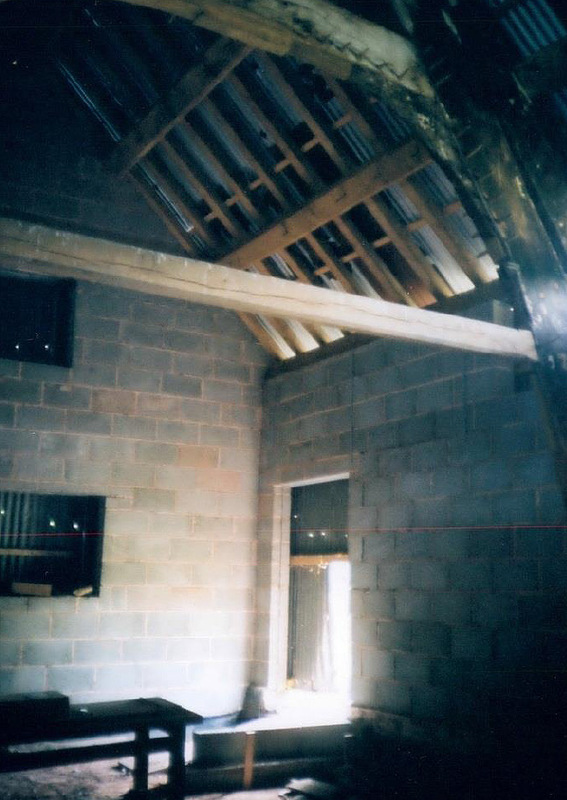 The high end of the hall, with its inserted floor, looking through the opening into the solar or main bedroom. Apples from the adjoining orchard were stored here when I was a child. Tallies of the bag numbers were neatly written on the wall. In the room below was hay for winter feed for the stock. Above. 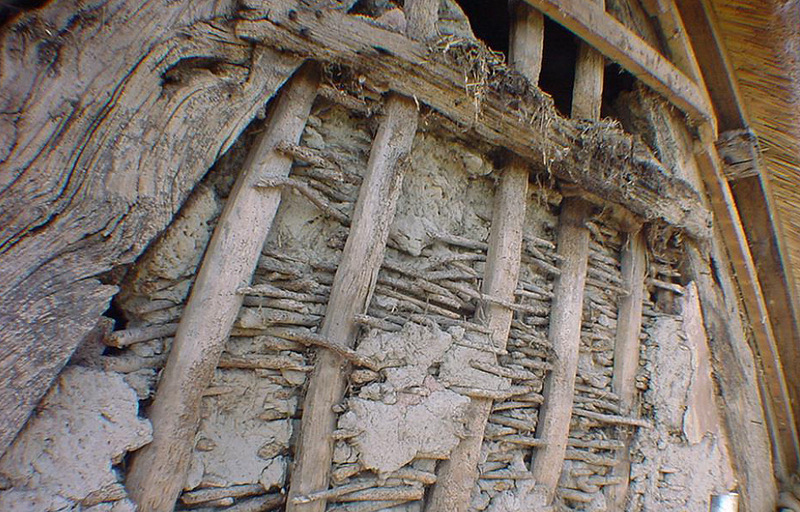 Many roofs were under-drawn with earth or lime plaster fixed to laths, as is the case here. The smoke blackening of the rafters attests to this being a later addition. 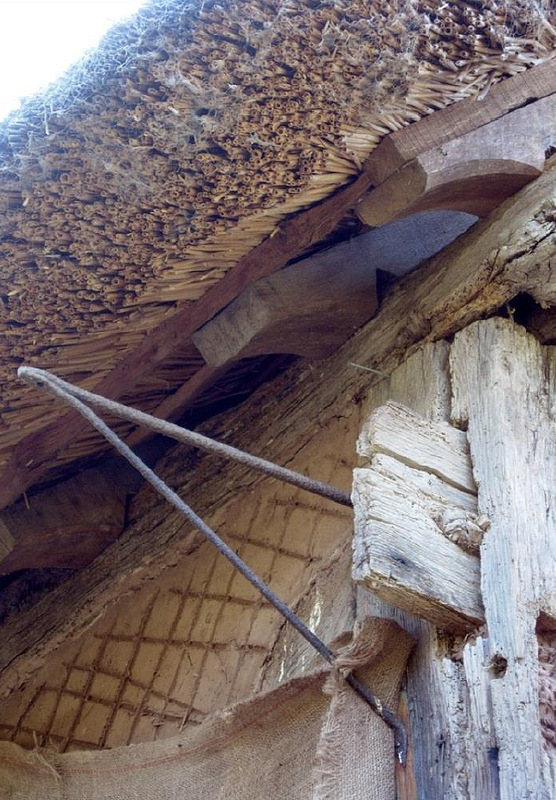 Perfectly tight dovetail joints; the short cruck spur tying the wall post to the cruck blade and, above it, the tie beam between the pair of cruck blades. 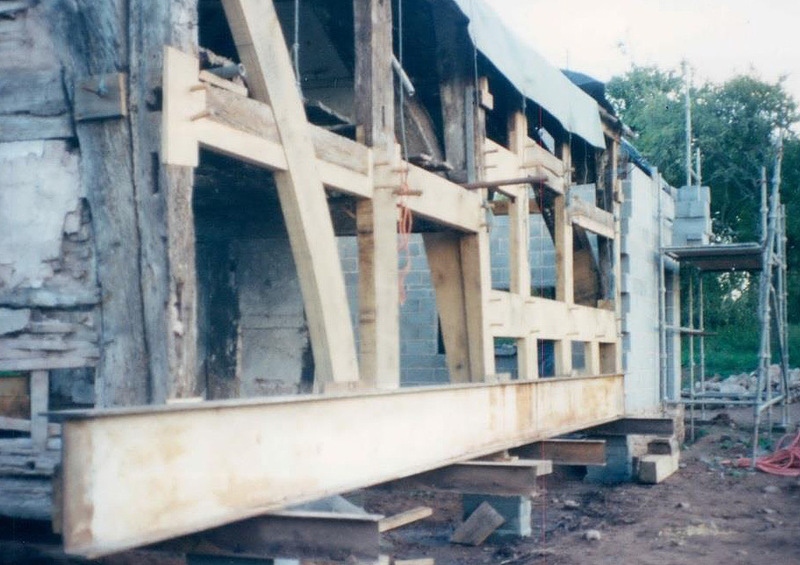 It is hard to believe the frames would have been put together with unseasoned timber. Above. There is no evidence of the large triangular opening between the two rooms as ever being filled in; not a slot, peg hole or nail. 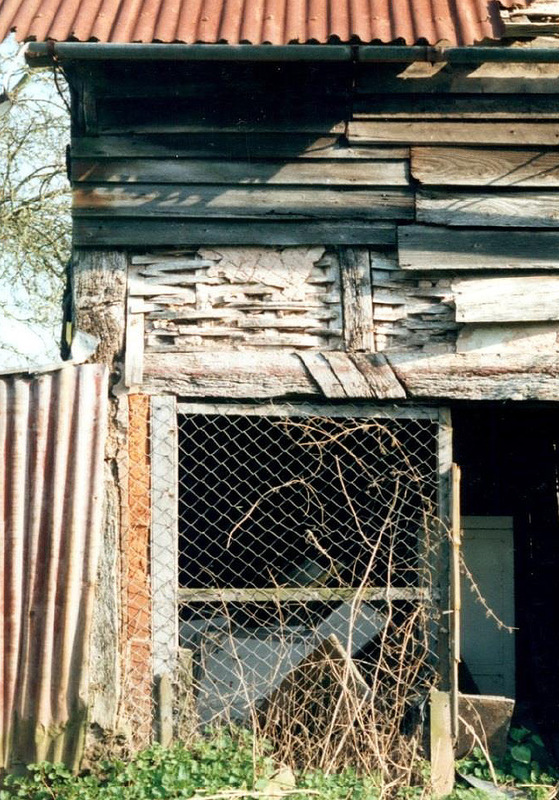 Understandable when the building was a single dwelling, but more difficult to comprehend when it became two homes. 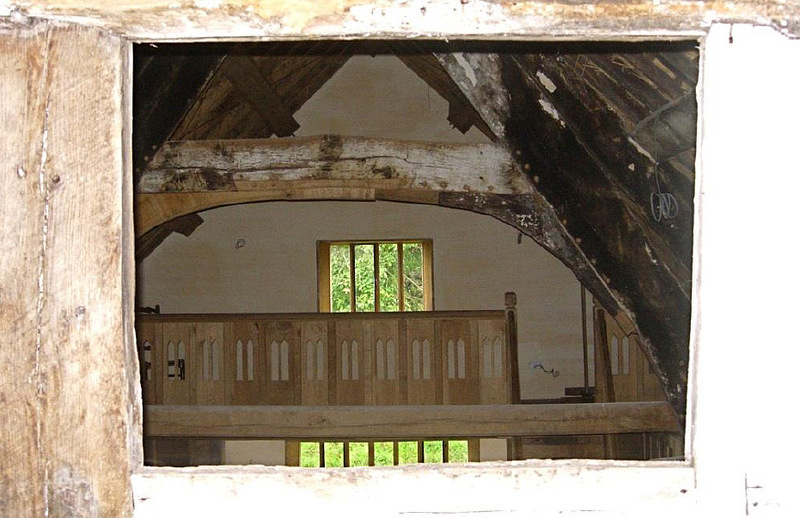 Looking out through a window opening in the centre bay truss which was originally the centre of the hall. The third bay was lost for whatever reason. Now sitting four feet from the neighbours boundary it was felt justified to move the building in order to reinstate the hall. 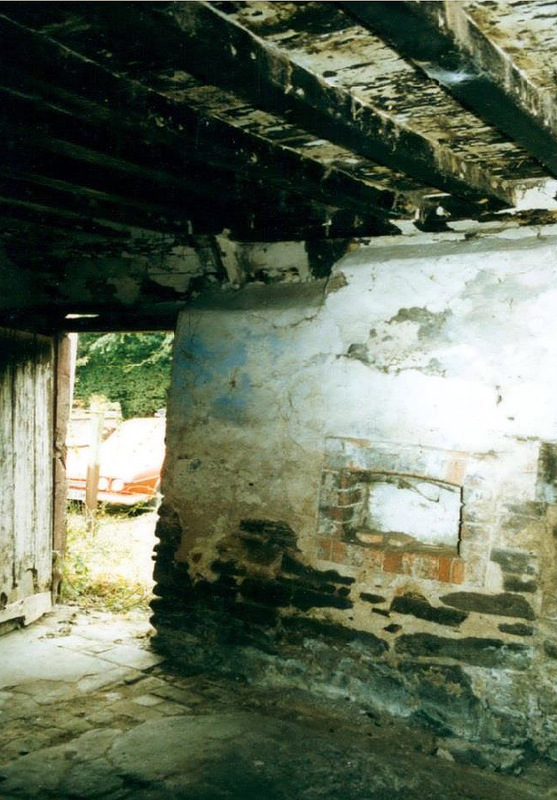 It was hoped the stonework infill housing the fireplaces would have been built around the cruck blade. 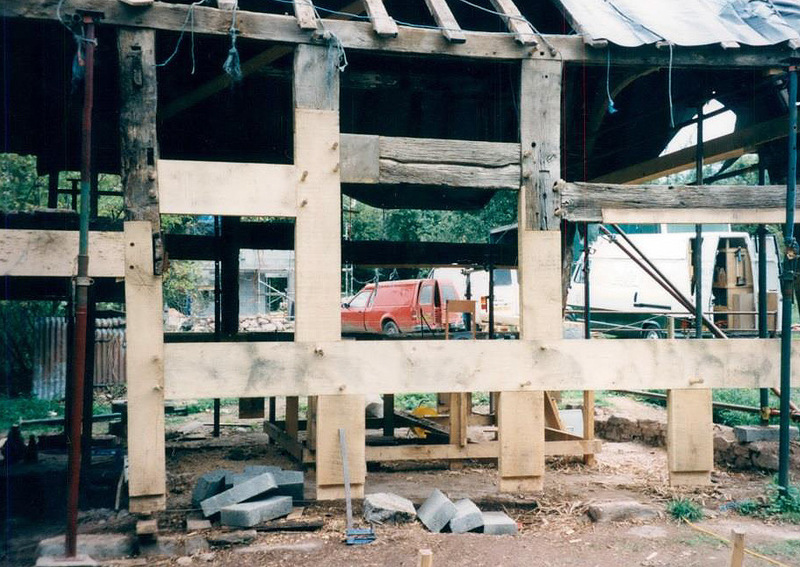 As it turned out the base of the cruck frame and wall post had been cut off, resulting in the loss of most all of the framing to head height in the west wall. 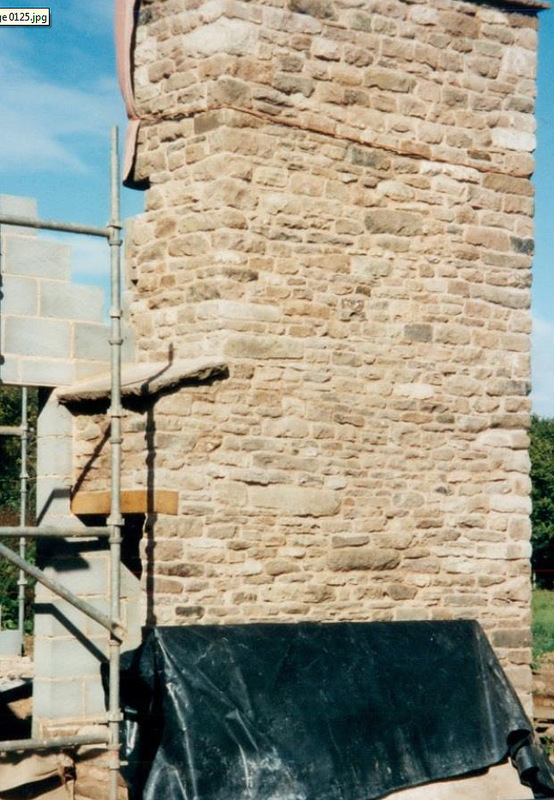 The stone was reused in the new chimney and plinth. 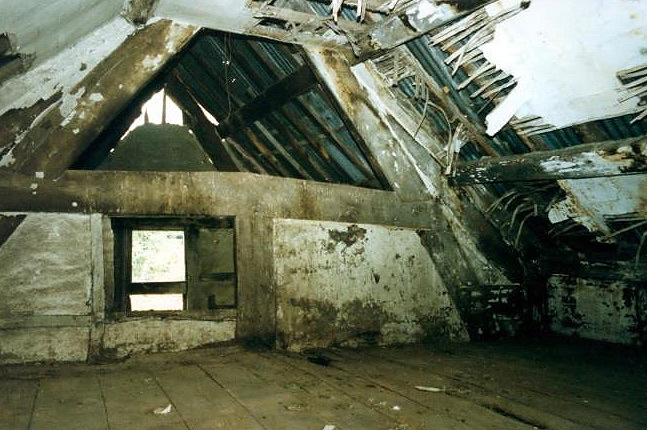 The survey and repair schedule having been done earlier, the building was stripped out ready for repairs to begin. 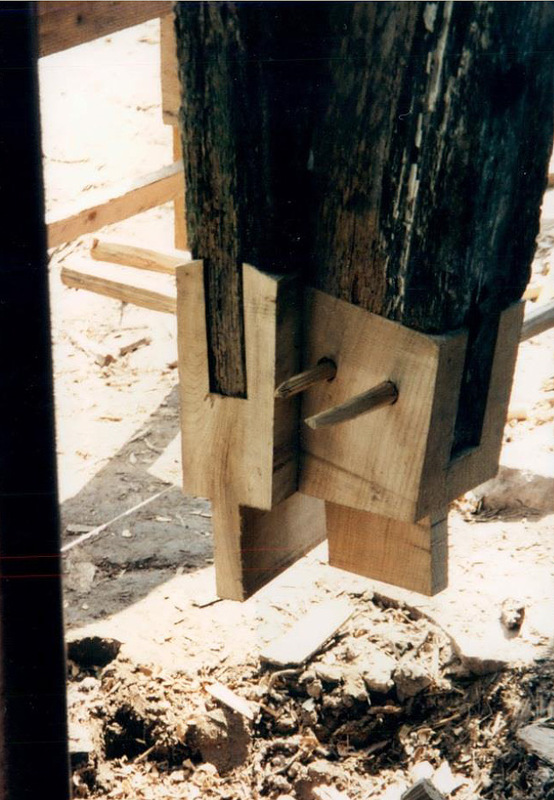 Using penetrometer testing to determine density (the boring of a very fine hole into the timber while measuring the rate of penetration), enabled Robert to decide what should be discarded and where joins should be made. The eastern elevation was more intact, though a large length of the bottom wall plate had all but disappeared. 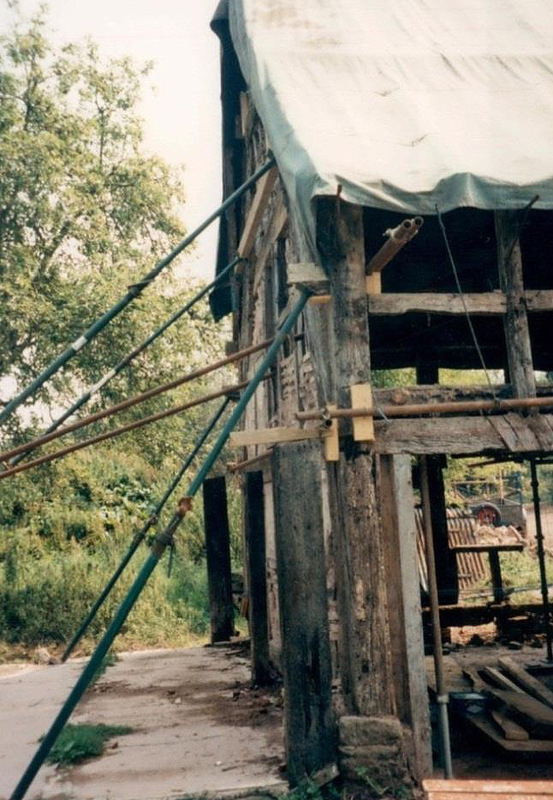 With the loss of the wall plate on the west as well this meant there was very little to stop the centre bay truss, which formed the end of the building, from spreading. Above. 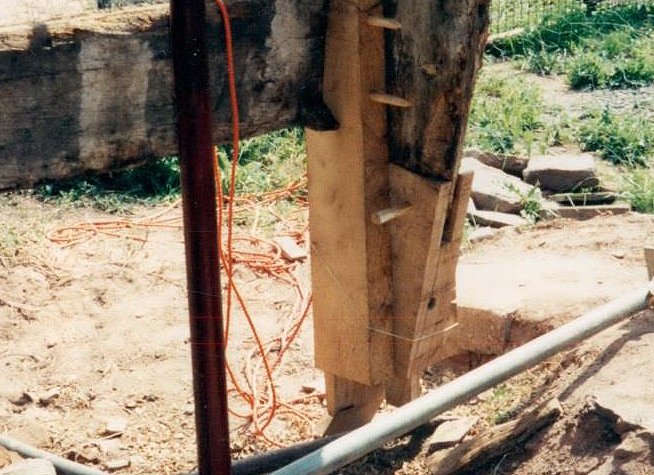 The tie beam had pulled out of its housing and the supporting knee was gone. Firstly the frames were straightened, plumbed as far as practicable, and pulled back together where they had spread apart. The north wall still has quite a lean to it. 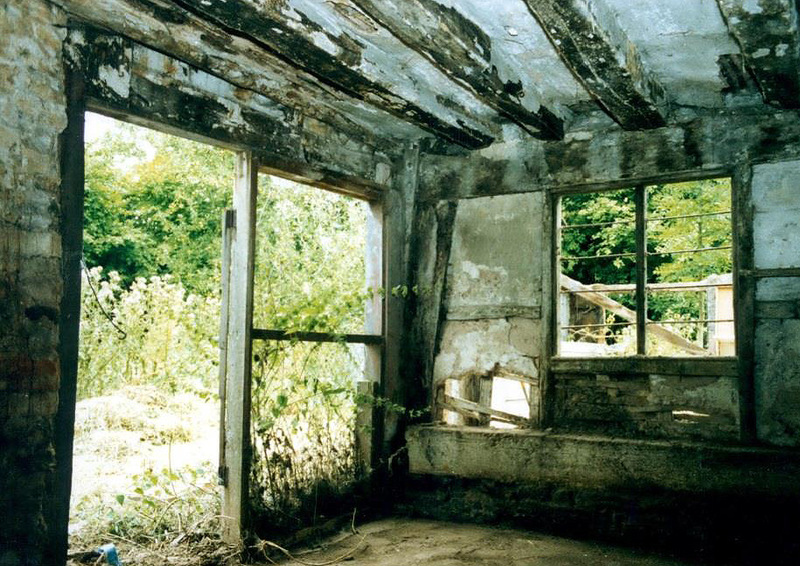 Wherever possible, repair work was done in-situ so as not to disturb the frames any more than necessary. 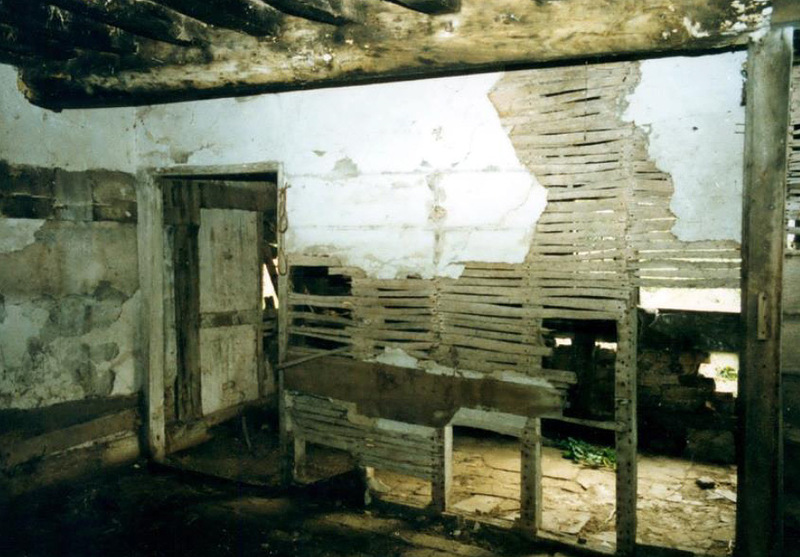 Well-seasoned timber we’d had milled fifteen years earlier was used for patching and joins. On the centre bay truss templates are in place ready to make repairs. 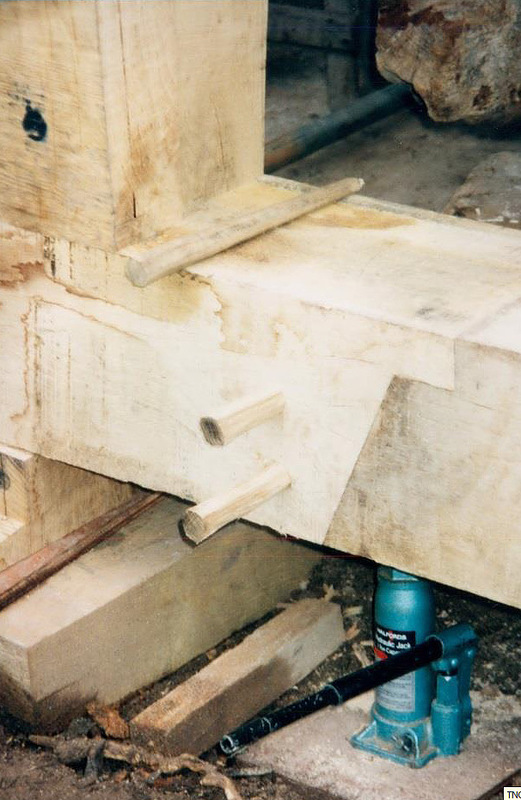 Each piece of timber that needed working on was marked by the engineer: where the cut was to be made and the type of joint. 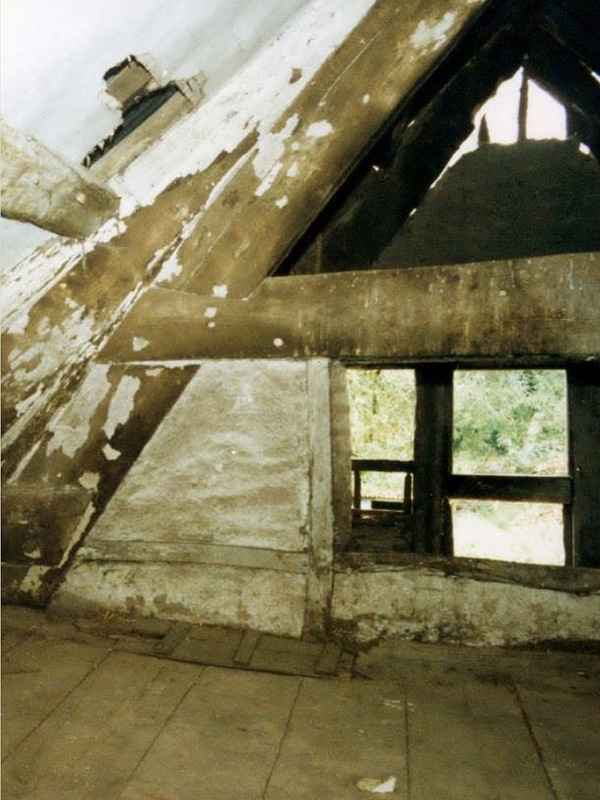 Above are two pieces from the centre bay truss: the tie beam and one of the knees that creates the graceful arch. 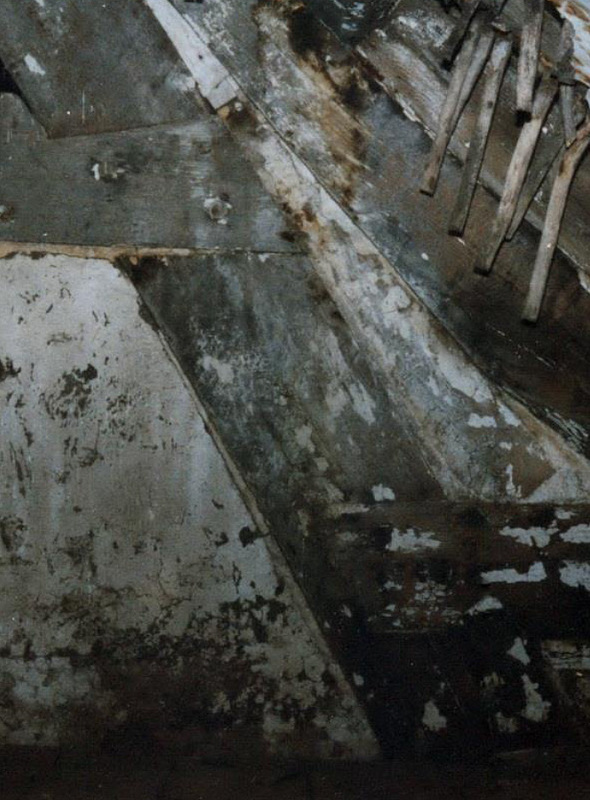 The completed repairs; this was the face exposed to the elements. The other side of the truss was in much better condition. 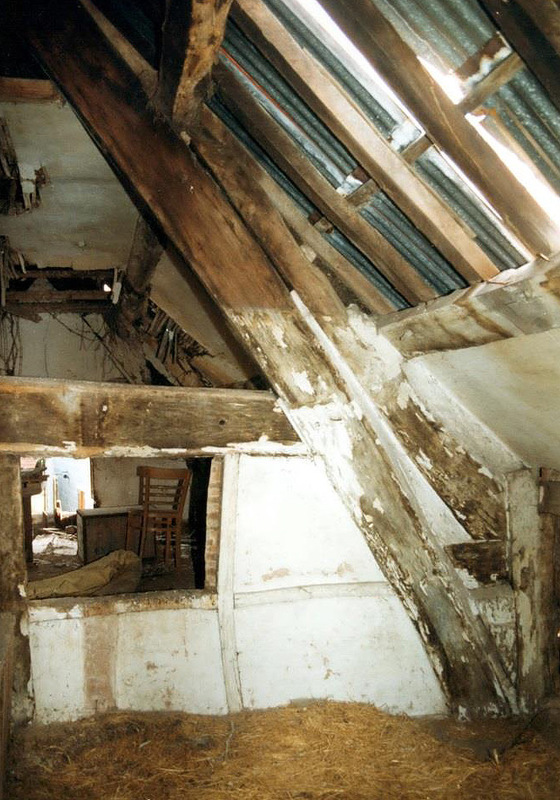 Although looking like it might be beyond repair, most all timber was sound and very little material was lost. Apart from a few smaller members used to subdivide the large medieval panels, which were added at a later date, all framing was original. 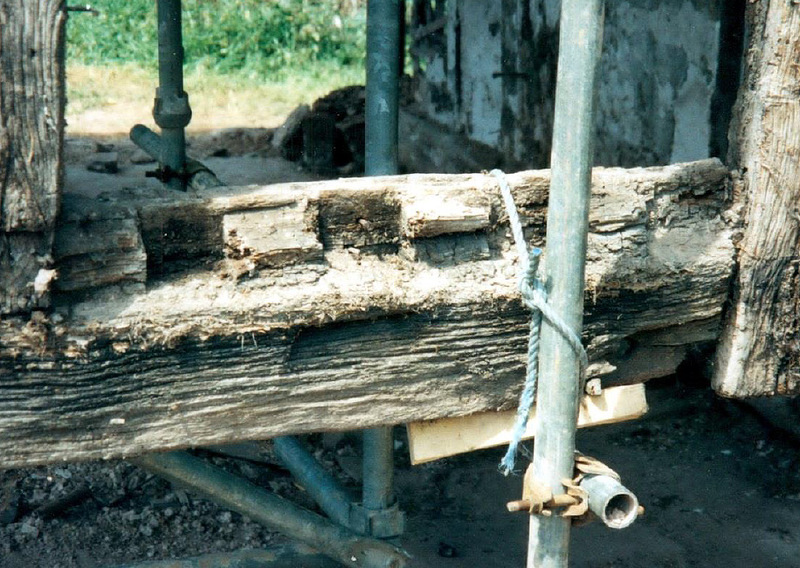 The base of the west side of the centre bay cruck and wall post. The foot of the eastern side of the centre bay truss and wall post. The removal of the masonry in the west wall revealed mortices that would have housed window mullions. When the corresponding panel in the eastern wall was stripped out a similar detail was revealed. Since this deviated from the plans we had to apply for a change in the consent in order to replicate what would have been there originally. With the cills being so high, in order to be able to look out of the windows, we decided to raise the floor level in the hall, so creating the step down to the parlour/solar. 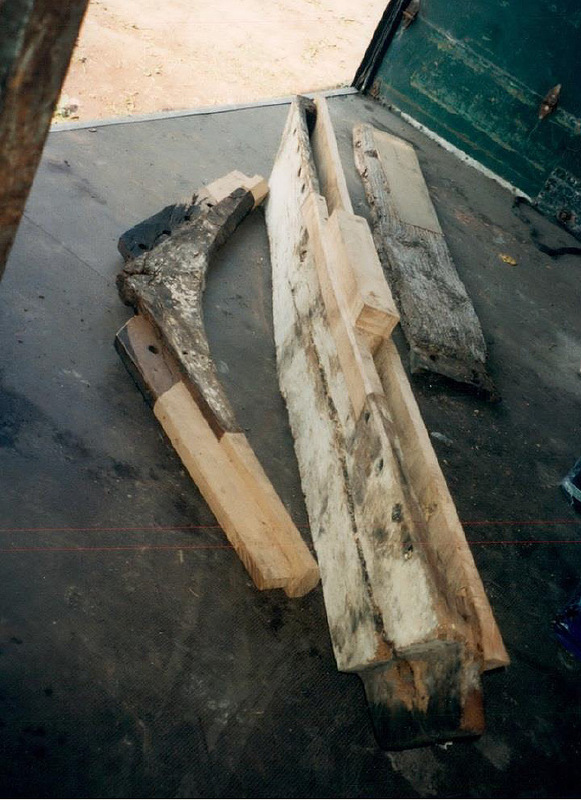 The remains of the mortice holes that would have housed the base of the window mullions. There was only evidence of three original windows: the two in the hall to either side of where the high table would have been positioned, and one in the solar facing north. 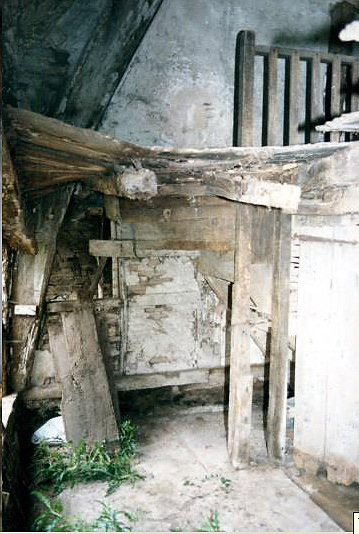 None were found in the parlour, though there could have been one in the west wall where the framing had been removed. 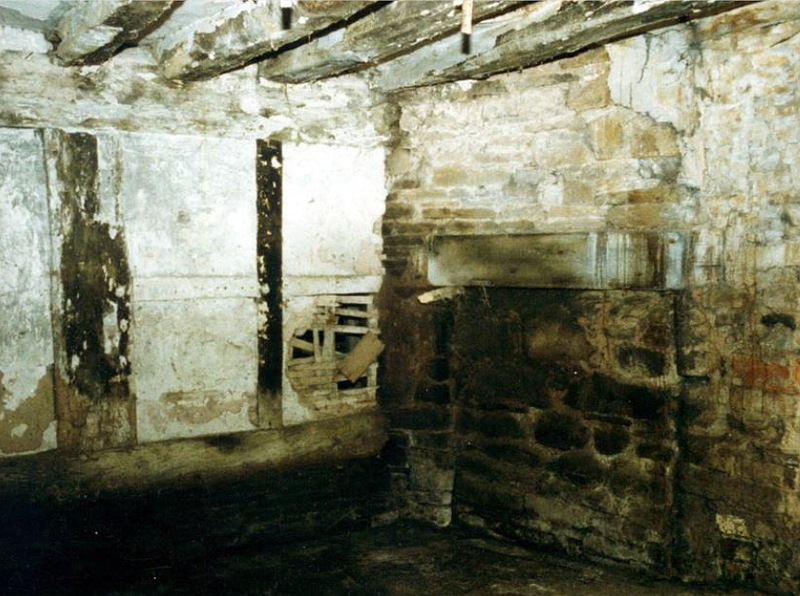 Much of the framing in the west wall had to be replaced as a result of the removal of the stone infill used to create the fireplaces. 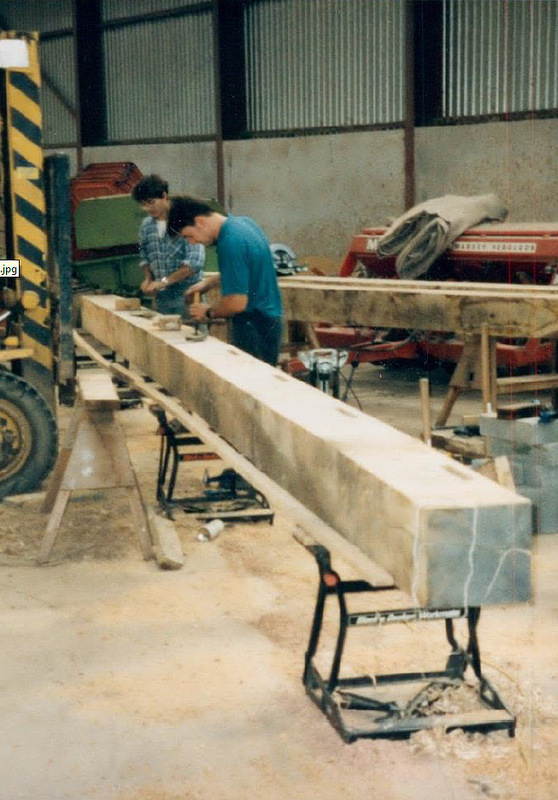 Here we have the base of the cruck frame and wall post. 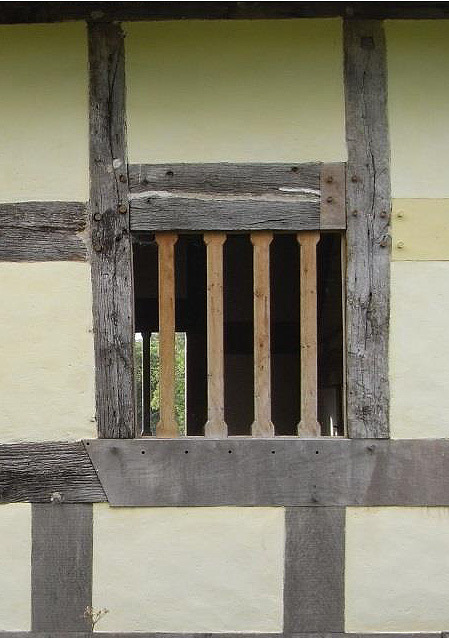 The large horizontal member forms the cill of the window and has a groove cut into the top of it that would have carried a shutter. The shutter groove meant it was wider than other framing members, which perhaps accounts for the scalloping that allows it to finish flush with the framing below. It is a detail that was copied from the opposite wall, below left. The wall plates on the eastern elevation had all but sunk into the ground with the subsequent loss of the ends of the posts. The large infill panel above is the location of an original window. To the right of it is a later small leaded casement, which is why we put a similar opening next to the new chimney. The west wall awaiting a new cill beam. 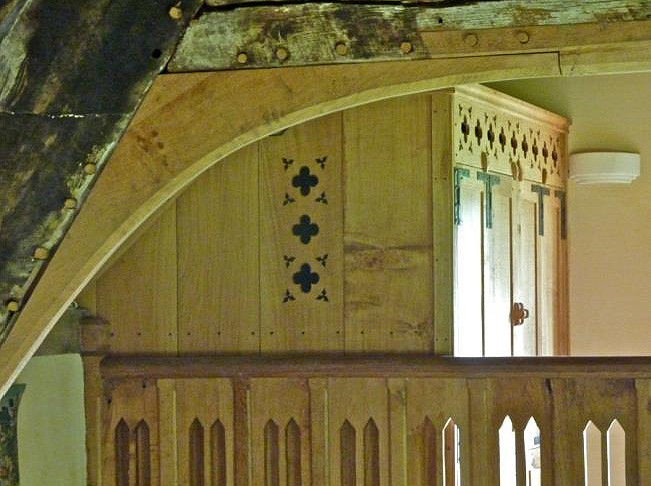 Where a piece was replaced in its entirety, freshly cut green oak was used. John and David cutting mortices in the new cill beams. 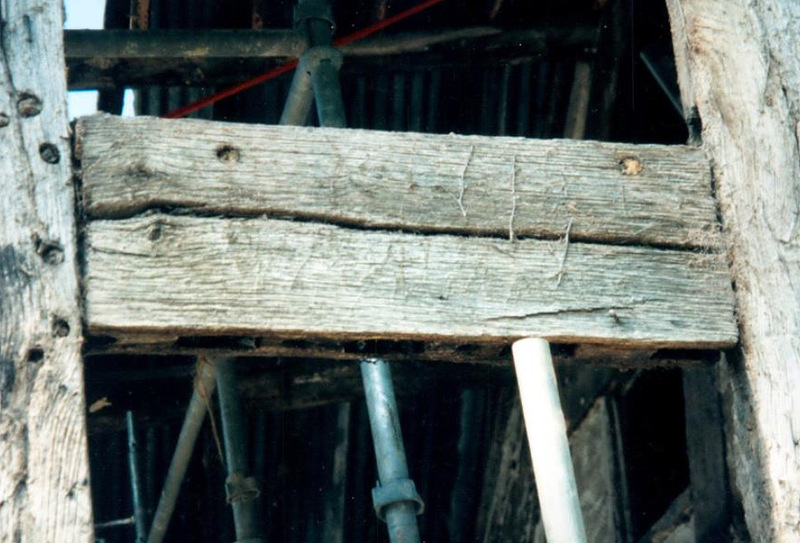 The cill beam in place showing a detail of the join where the two sections meet. While the timber frame was being repaired Royston and his mate set about preparing the new site. The new location had a slope that was levelled in order to minimise the height of the stone plinth, which otherwise would have been a foot higher at the northern end. 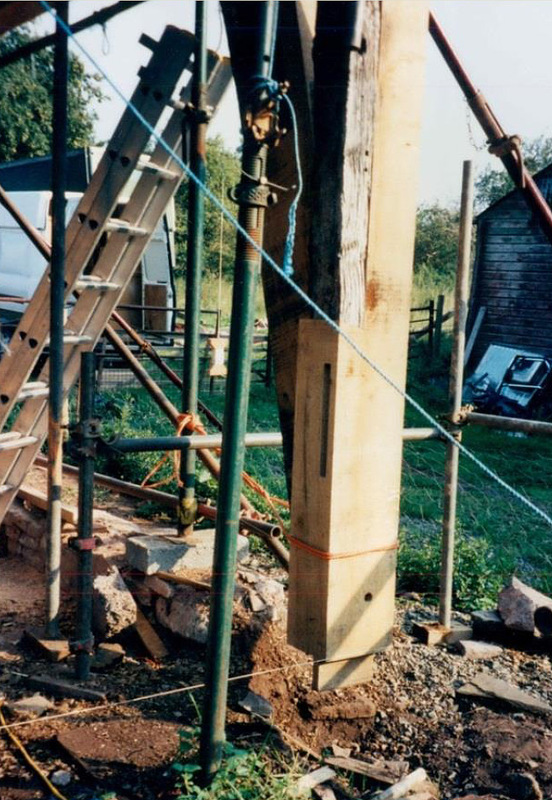 Much of the stone for the chimney stack and plinth was salvaged from the original site, though nothing was taken from below ground level. 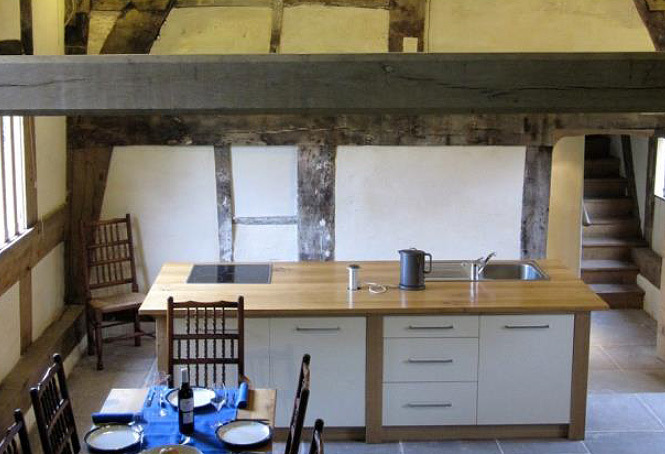 A decision was made not to replace the missing bay in timber framing but to use lime plaster over masonry to recreate the space. 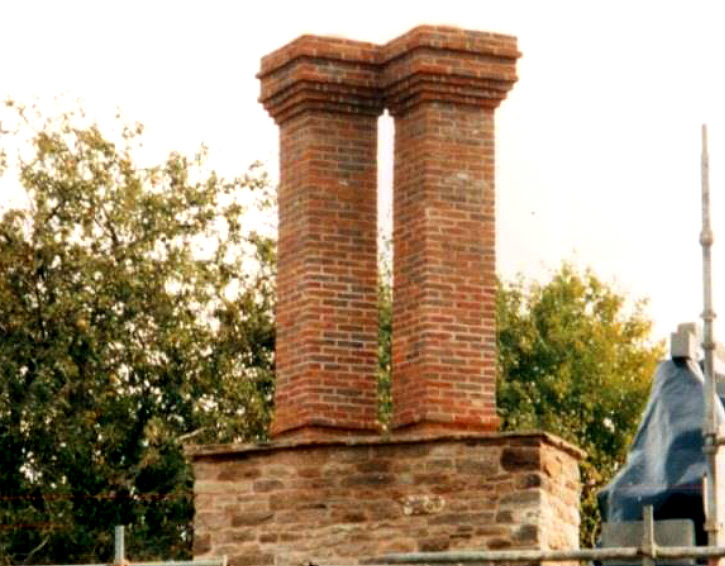 The beautiful chimneys, which would not have formed part of the original building, were built of thin handmade bricks. 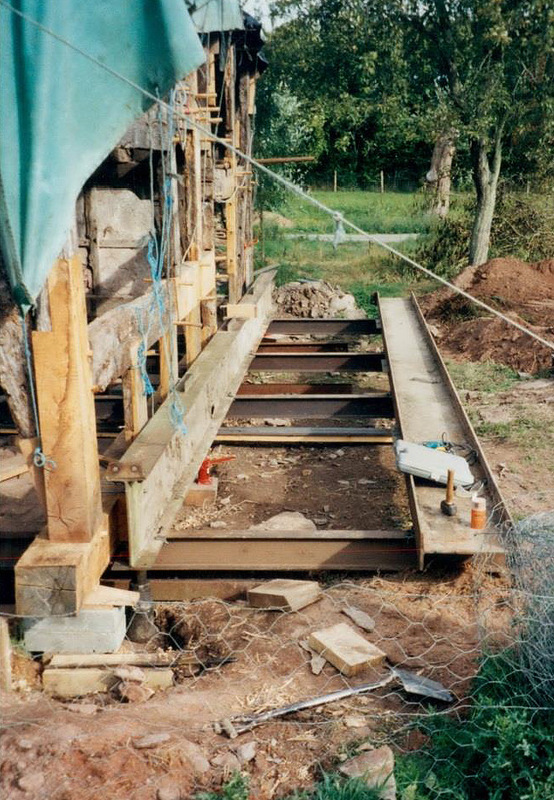 With repairs to the frame completed, the next stage was for Keith to build a steel platform under the building to allow it to be skidded to its new site. 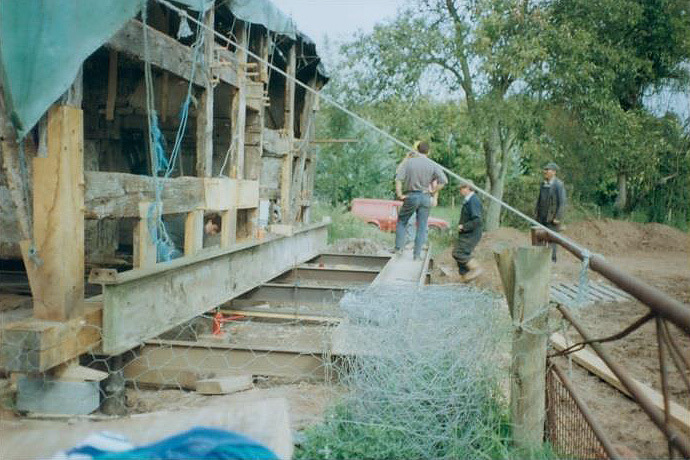 The platform in place, the ground levelled, it was time for George and John to pull the house to its new home. 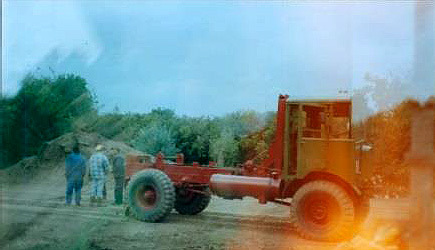 A vintage Matador timber crane was used to make the move. 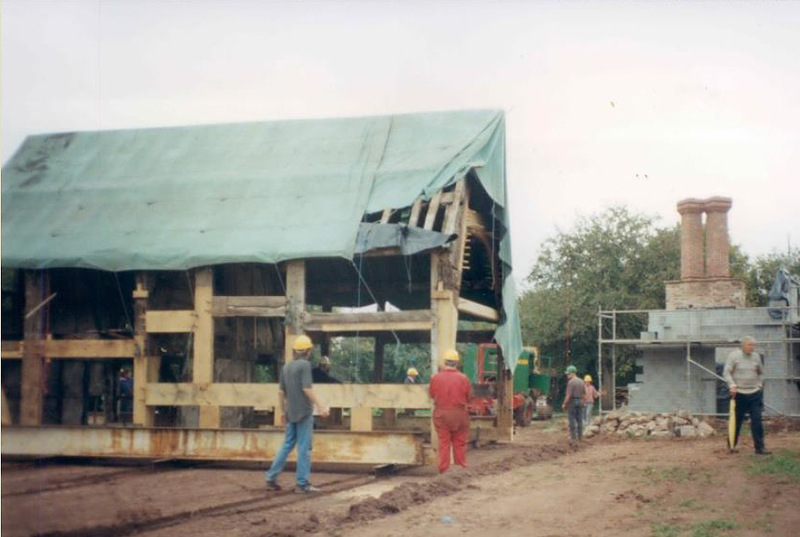 The frame was slowly, inch by inch, winched across to its new site. Bill had not only levelled the ground but ‘fluffed’ up the top few inches to make the ride more gentle. As well as all the people involved in the actual move, over the course of the day and during the slow progression across the orchard, many onlookers came to view the unusual spectacle. Deceptive perspective. The house is heading in the right direction and all went smoothly. None of the panels were lost or damaged. Totally unrelated to the move, the triangular panel at the top was unable to be repaired, only the staves being left in place. The end of the day, resting on its new site. Ready now for the delicate task of butting it up to the new bay and chimney, and the levelling and removal of the steel frame. The next day final positioning took place using hand winches and rollers to bring together the old and new. 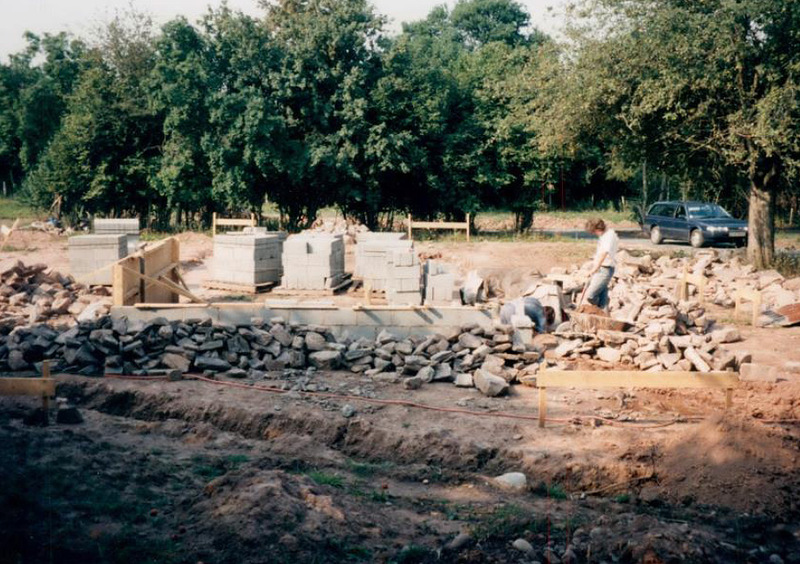 After levelling, the steel frame was removed and the stone plinth built up to the wall plate. Unseen is the foundation, going three feet into the ground, for the plinth to sit upon. 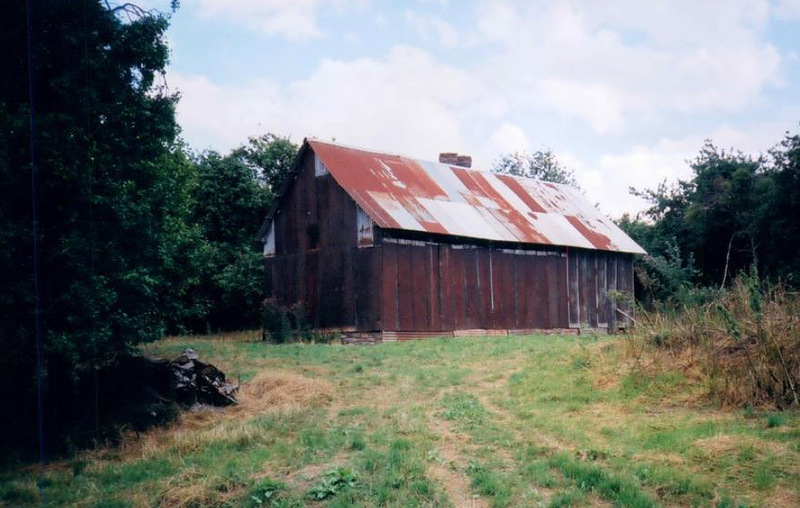 The walls and roof were overlaid with battens and corrugated iron fixed over the whole structure. Even when shrouded in tin and with a concrete block shell to the third bay the beauty of the hall could be anticipated. The space had been recreated for the first time since the hall was floored in hundreds of years earlier. Safe from further deterioration, Stage 1 of the restoration project ended. It remained in this state for several years, awaiting its metamorphosis while we deliberated over its future. 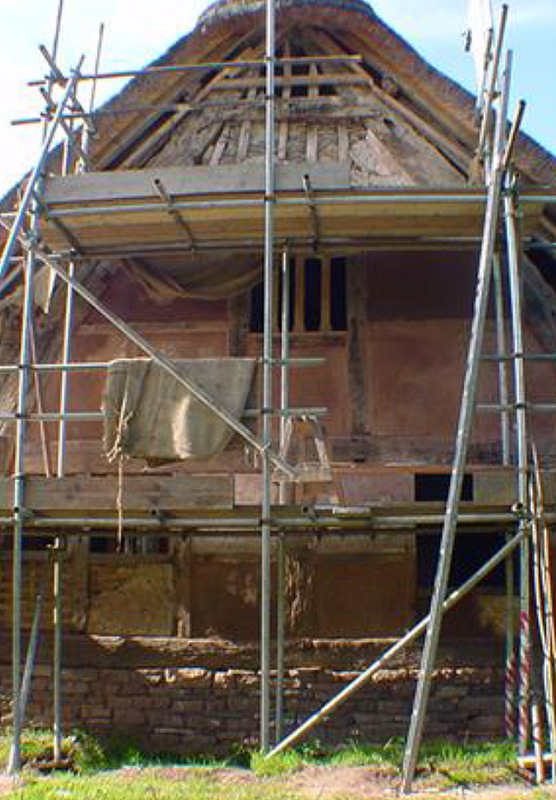 During the period of inactivity, our ideas changed on how the restoration should be finished. A more holistic approach to the project was developed, which was something of a challenge as the house was treated as a new build. 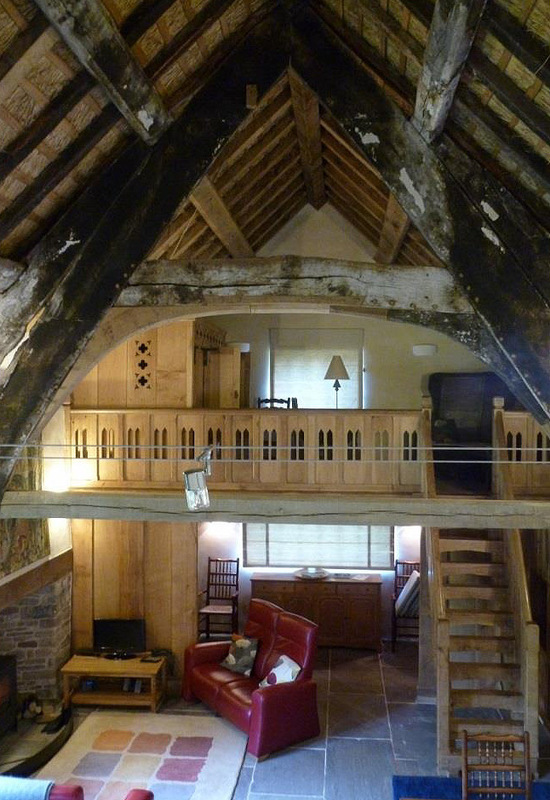 Because of the move we had to comply with building regulations, an anomaly for a C14th building. My living in New Zealand with a partner and children meant I’d missed out on the first stage. Being a builder and cabinetmaker, I wanted to finish the project myself, which goes some way to explaining why it became so long and drawn out. 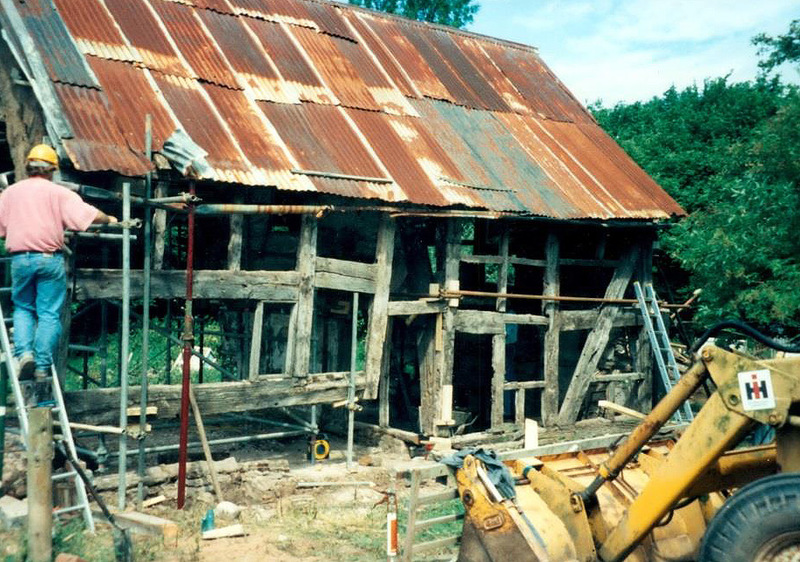 For each of the last five years, when I managed a visit of two to three months, my cousin Ian was on hand to help with the woodwork and general building. Jacqui and Robert were there for the important design decisions. Keith, Clive and John, more cousins, were there for structural metalwork, ground works and fencing. Bill and George, old family friends, did the earthworks. Nick, who has known the building almost as long as I have, did the windows. Further support came from family and friends. Coinciding other trades with my visits was a challenge. 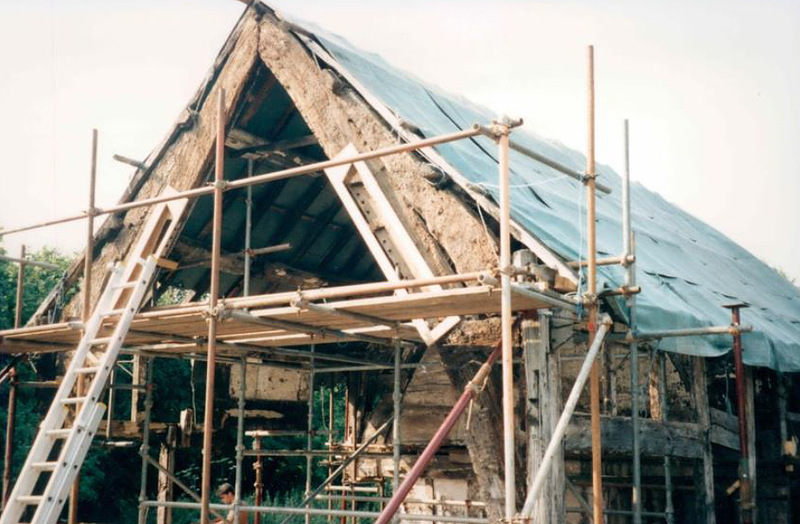 The removal of the tin roof marked the beginning of the second phase. We now planned to use traditional methods and natural products to complete the job. The proposed clay tile roof was abandoned in favour of thatch, which would give us good insulation and would allow the building to breathe. 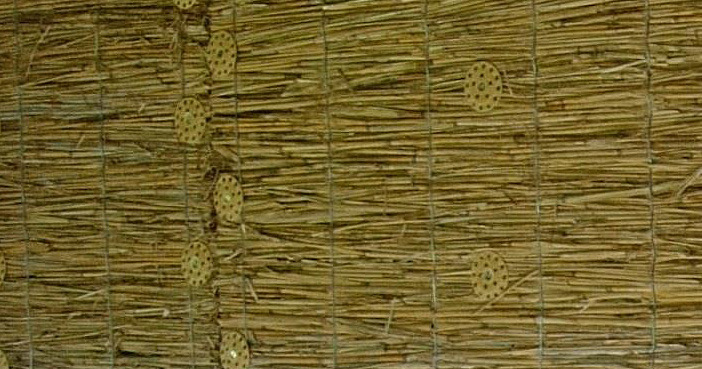 The coatwork (main body of thatch) is 12” thick. 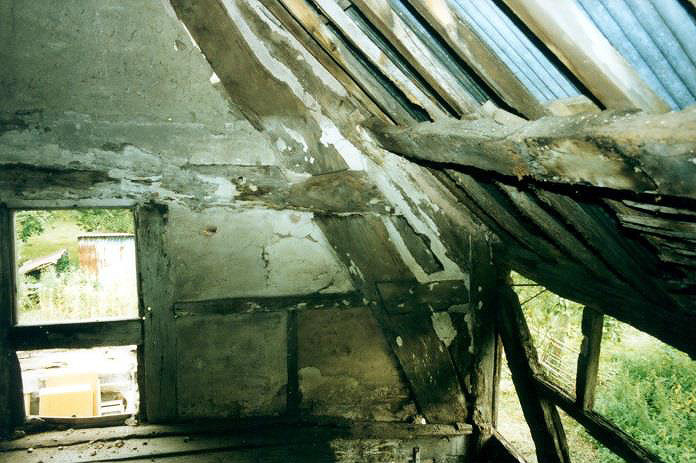 While theoretically the insulation value is good, the wind hitting the eaves can lead to draughts at times. In the hope of getting a lower maintenance roof, rather than the more traditional long straw, we opted for reed and sedge. 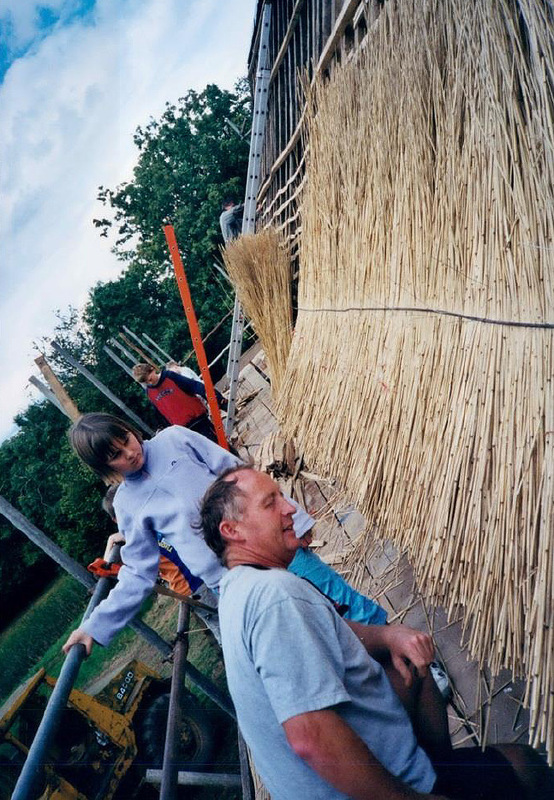 The reed for the coatwork came from the Tay Estuary; the sedge for the ridge from the Norfolk Broads; and thankfully, ‘Keith the Thatcher’ only had to come from Kington. The reed, as it arrived, in large bales. 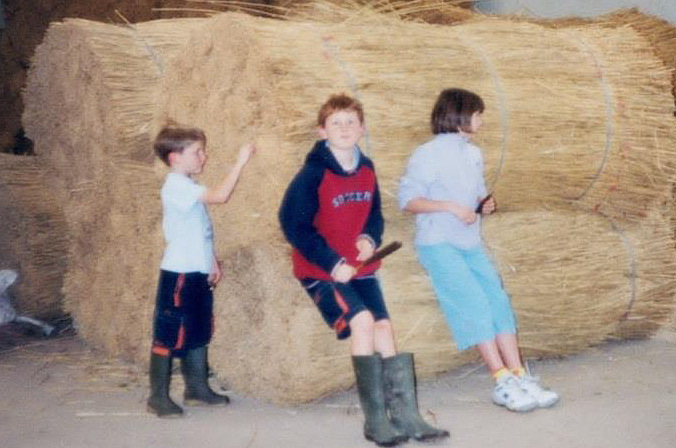 The kids: Emma, Thomas and Benjamin (Matthew out of shot). 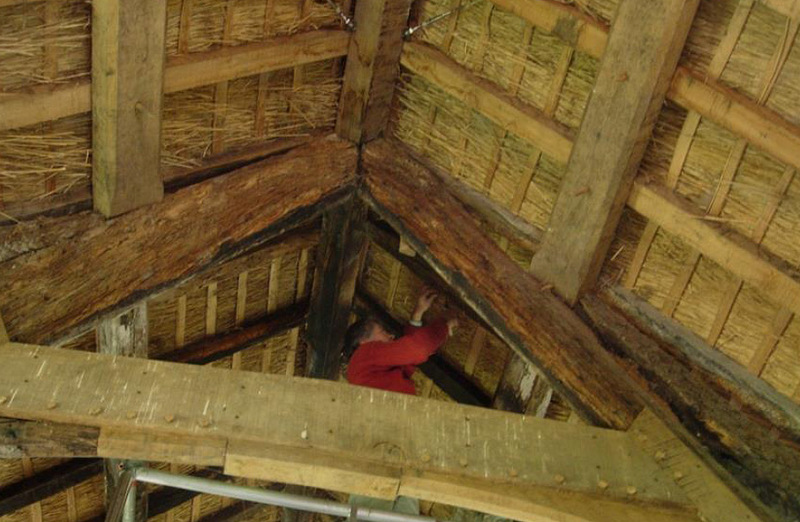 The short ‘feet’ on the rafters point to thatch having been the original covering. 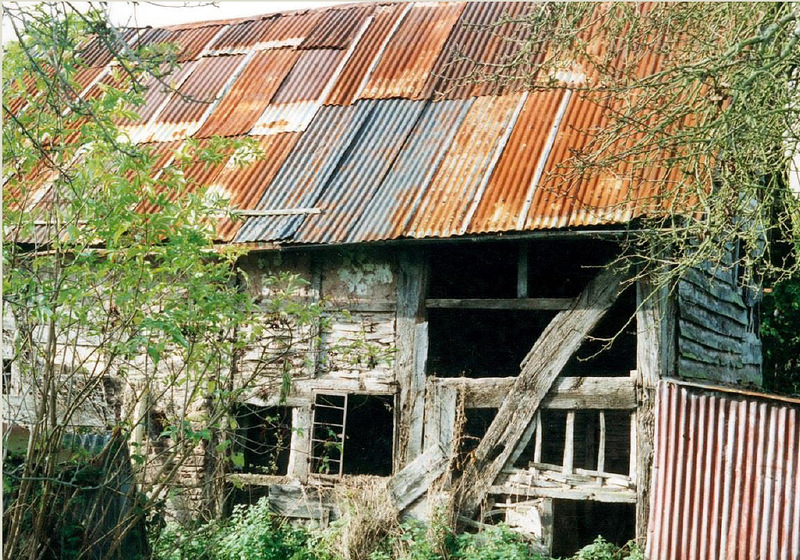 The metal brackets carried the gutters when the roof was of corrugated iron. With no gutters, in order to get the roof runoff away from the house, a trench was dug to below the level of the footings in which a drainage pipe was laid. 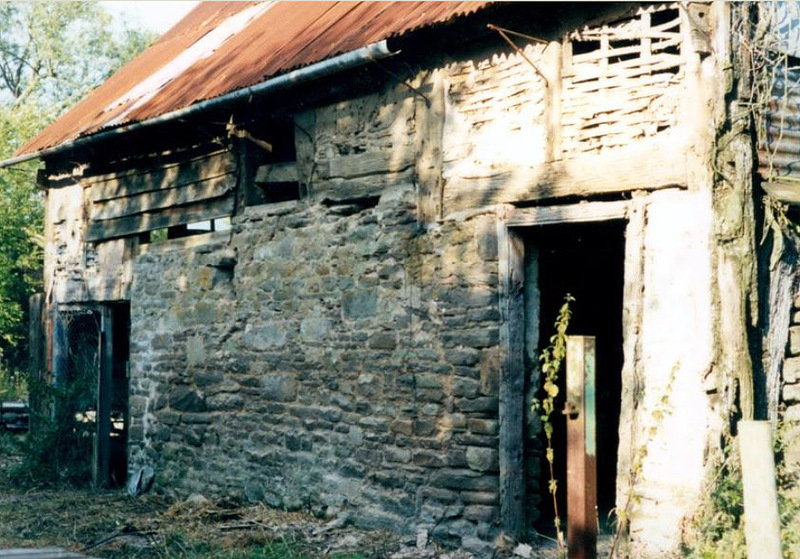 It was back-filled with drainage stone and takes the roof water away from the building into the nearby ditch. The hope of lower maintenance with the reed and sedge proved unfounded. The jackdaws and squirrels have continued to regard the house as their home. Breaking through the wire netting on the ridge was no problem to them and lead to the regular return of the thatcher. 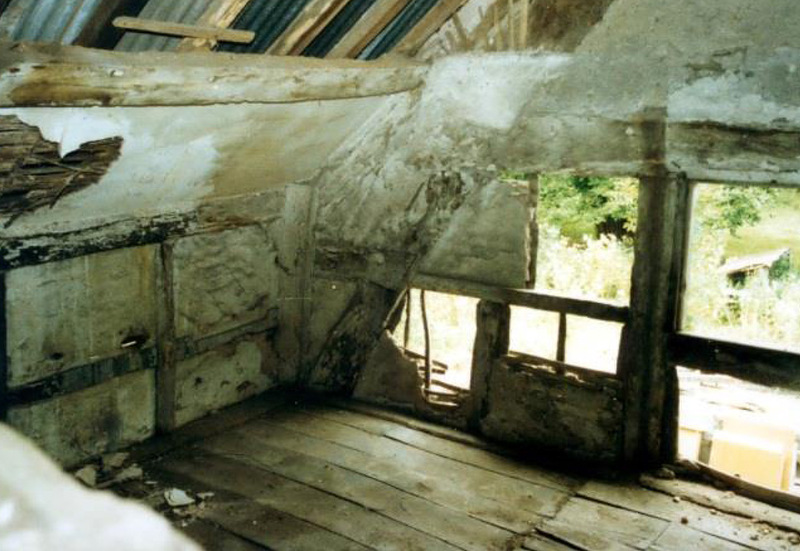 Insulating the roof was relatively straight forward but the walls presented more of a problem. 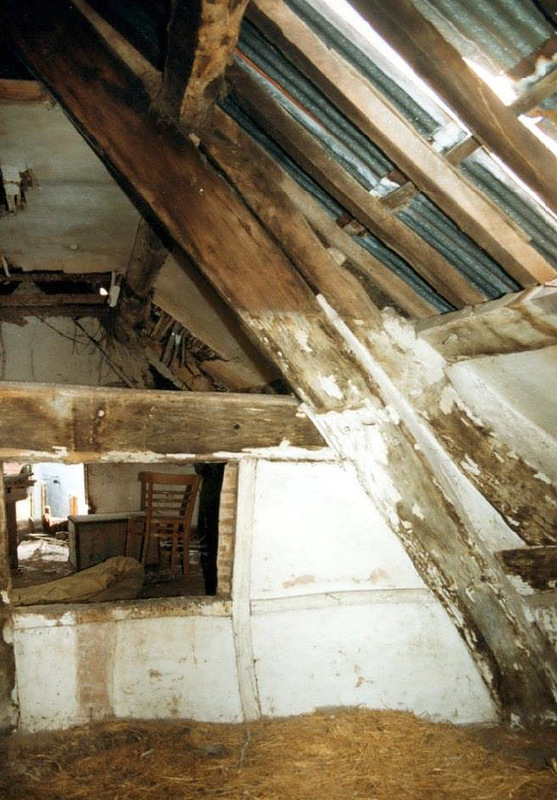 In places the timber framing is a bare 3” wide. The new panels in the hall have inner and outer skins of lime plaster over expanded metal lathing backed by building paper. In between is multifoil insulation separated with a cavity either side. 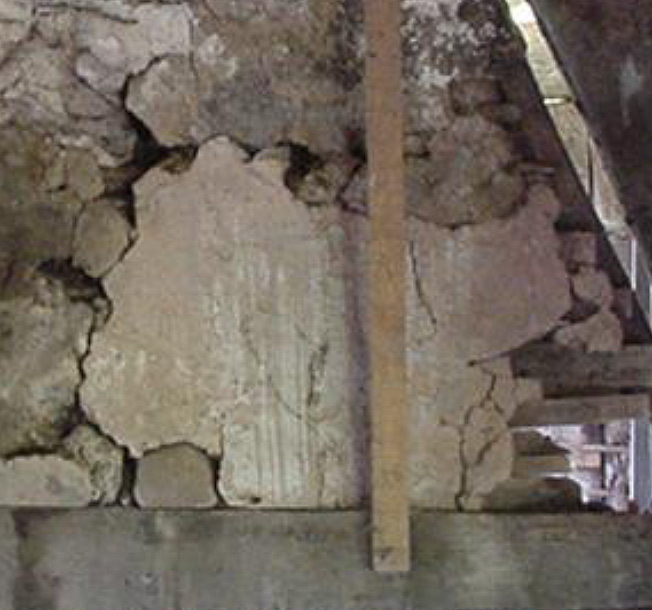 The retention of as many of the infill panels as possible was considered important to the character and integrity of the structure, while accepting that repair and replacement is on-going. Viewed from inside, the panels in the north wall looked reasonably together but, when the protective cladding was removed, it was clear the external face was in a much poorer state of repair in spite of the protection of the weatherboarding. 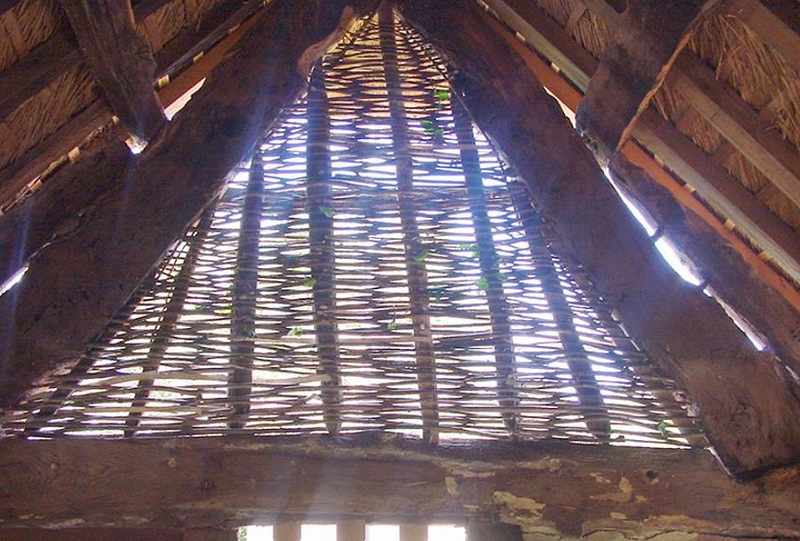 It was unfortunate that while most panels were able to be repaired, the single one in the wall reckoned to date to the original build, the triangular one at the top, was lost except for the staves. 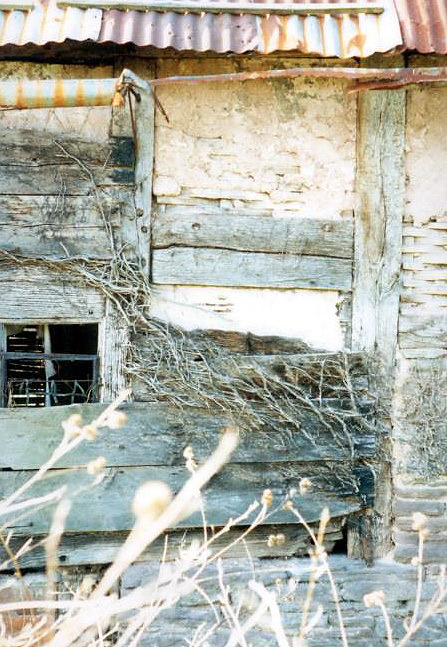 Ivy had found its way beneath the weatherboards and penetrated the panels. Consent has been granted to again weatherboard the north end. 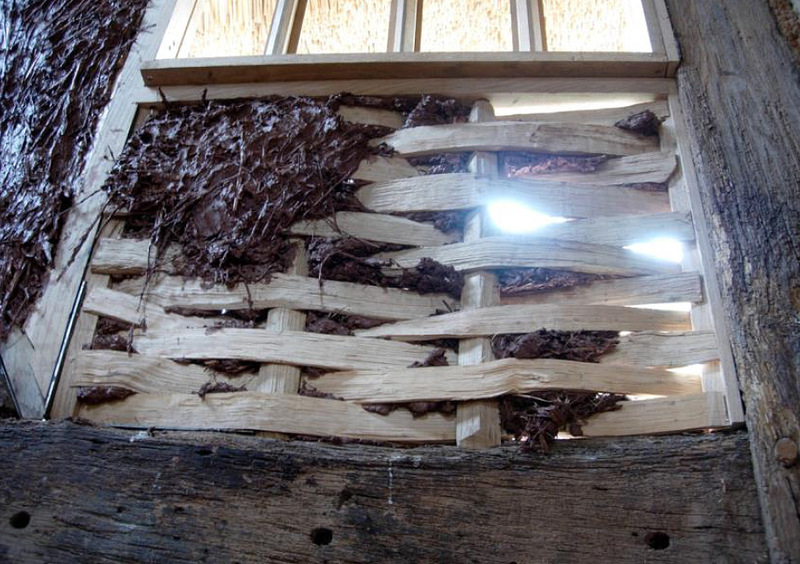 It would protect the timbers and delicate panels as well as allow for better insulation. 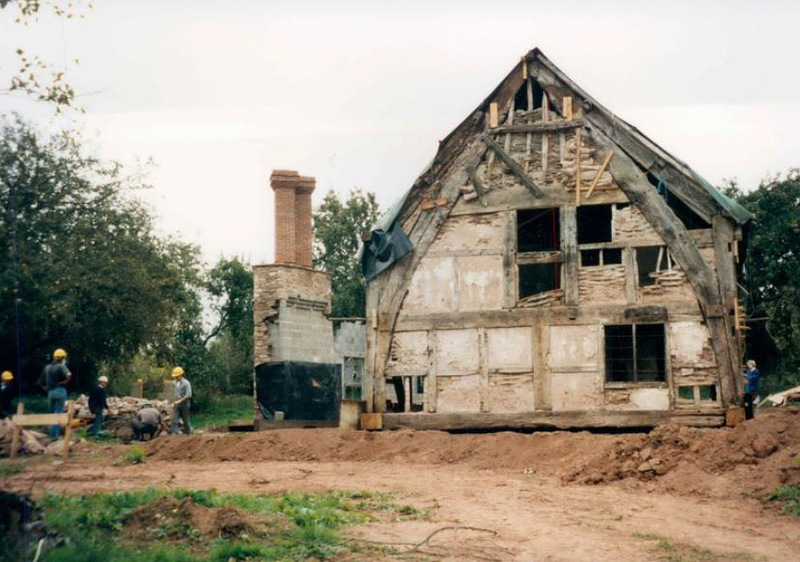 At this stage it hasn’t been done, as the exposed cruck frames are such a dramatic feature of the building. The top panel in the north wall remained untouched while we debated whether an attempt could, or should, be made to salvage something of it simply because of its age. It came back to the question of whether we were creating a museum piece or making repairs to send it into the future. 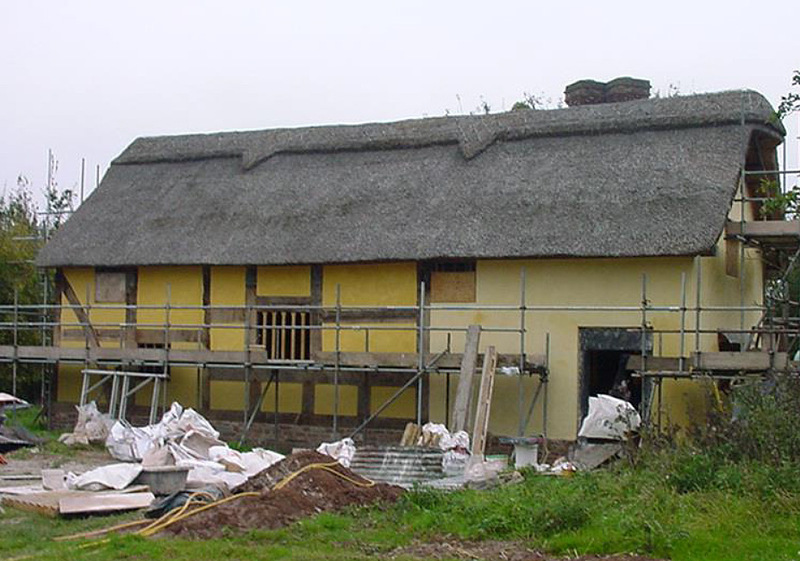 The future won out and we hope that with regular maintenance of the lime wash, the new hazel and daub is good for another century or two. New hazel rods woven between the original staves. The cross wall panels were in a much better state, having been protected from the weather, and all were able to be patched up. The two undivided large ones are reckoned to be original, so considerable effort was put into repairing the one above the door. A section of panel from the cross wall between hall and solar, dating back to the original build. Seed heads from grasses were clearly visible in places. The panel was cleaned of dust, dirt and loose material, thoroughly damped down and carefully patched with daub. 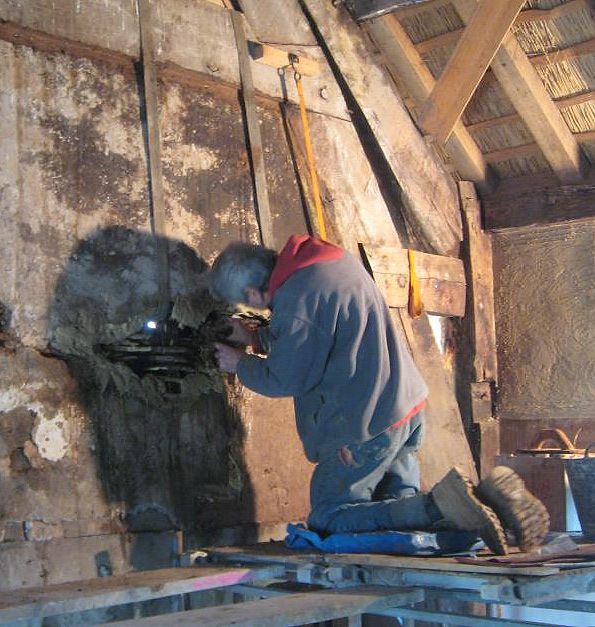 Repairs to an original panel in the cross wall. This is above the door from the hall to the solar. Note the smoke blackening within the panel, caused by smoke funnelling up through the thickness of the panel from the room below. 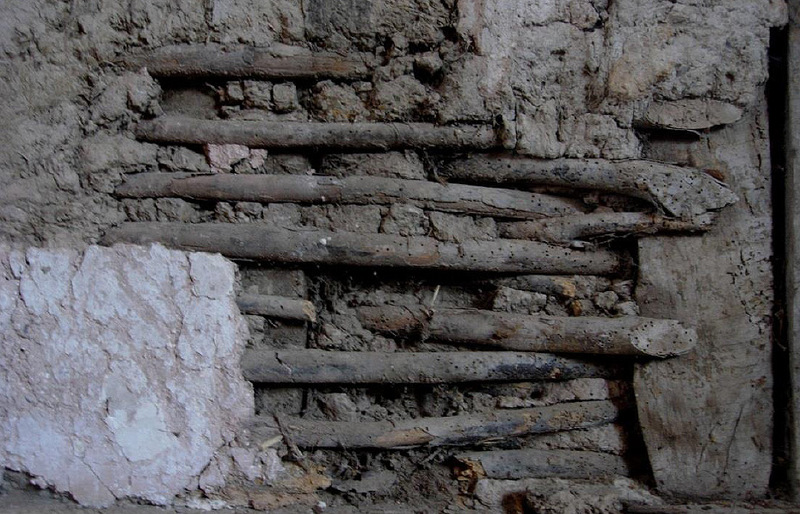 While nearly all new panels were of lime plaster over insulation, out of interest and because it felt like the right thing to do, a few new panels of wattle and daub were fitted. 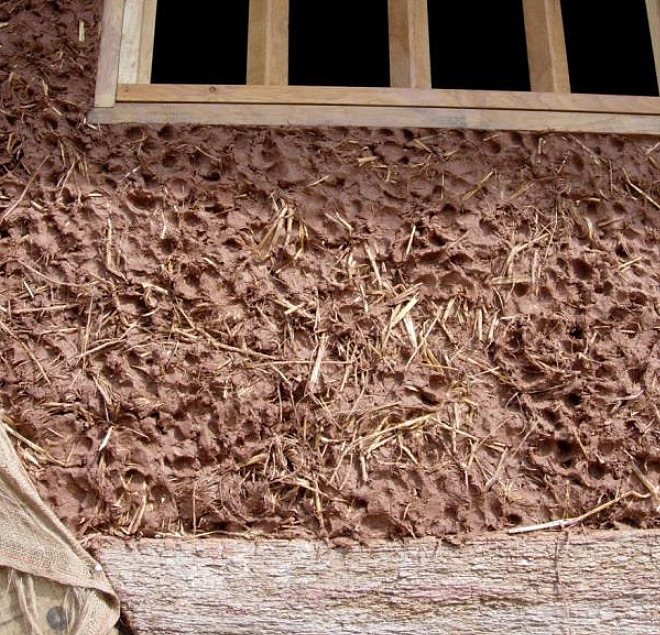 Clay for the daub was dug on site; hay and straw came off the adjoining farm. 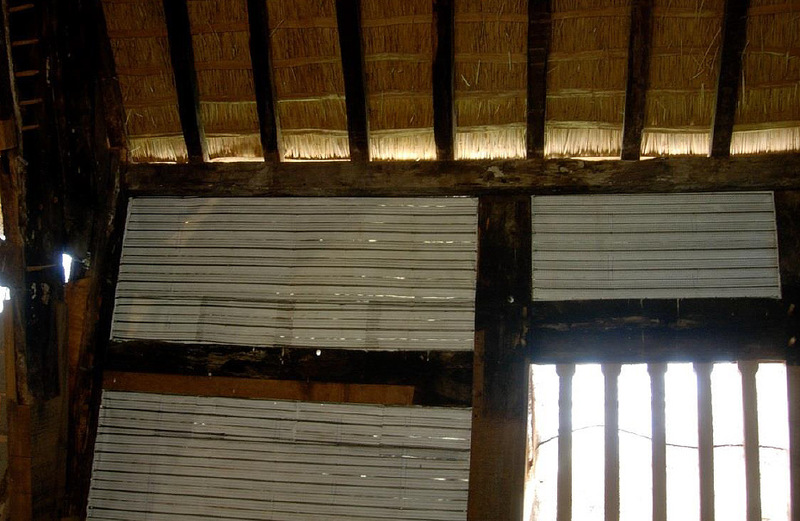 With the daub being forced into the laths from either side a homogenous unit is created, rather than a skin either side of the laths. The suface is worked up by hand. 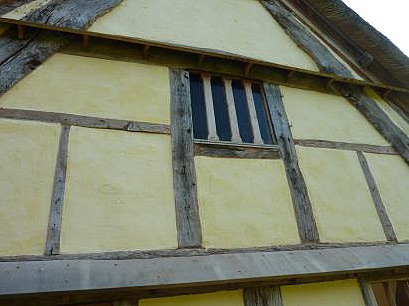 Various colours were considered for the exterior before the pale yellow was settled upon. 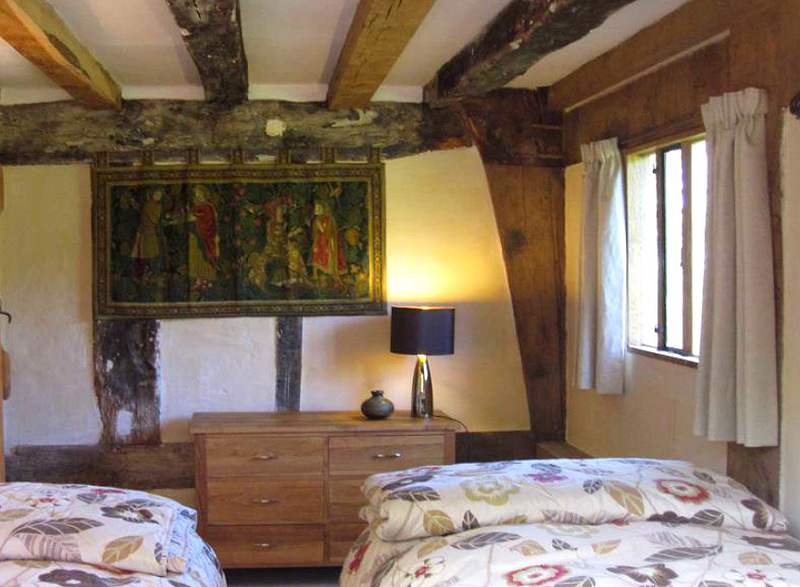 Typically medieval houses were colourful, unlike the ‘black and white’ so much in use now. 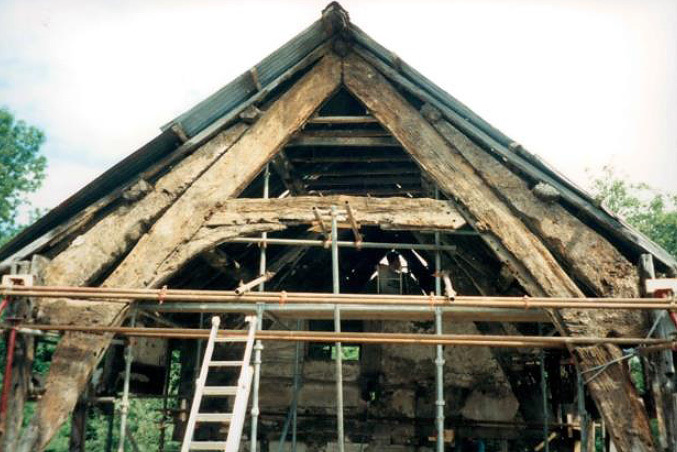 The timber frame would have been lime washed too. 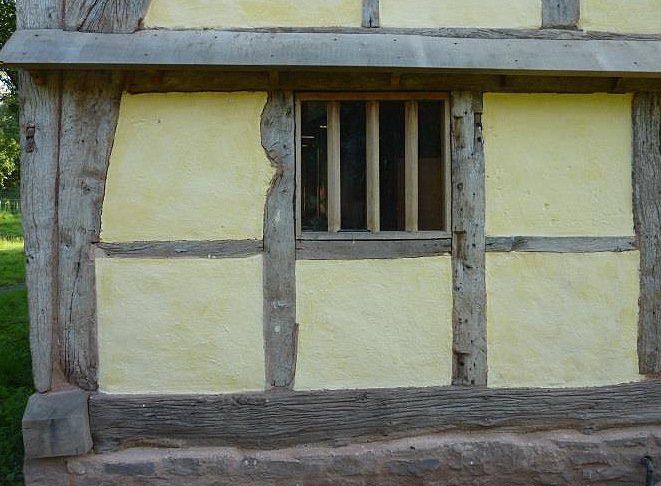 On the east wall we experimented with putting a deeper yellow wash on the timbers. 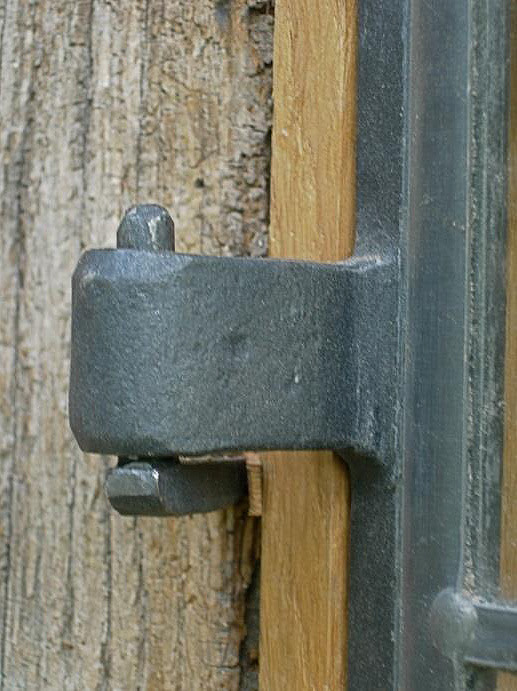 This would help protect against weathering; however, no final decision has been made. 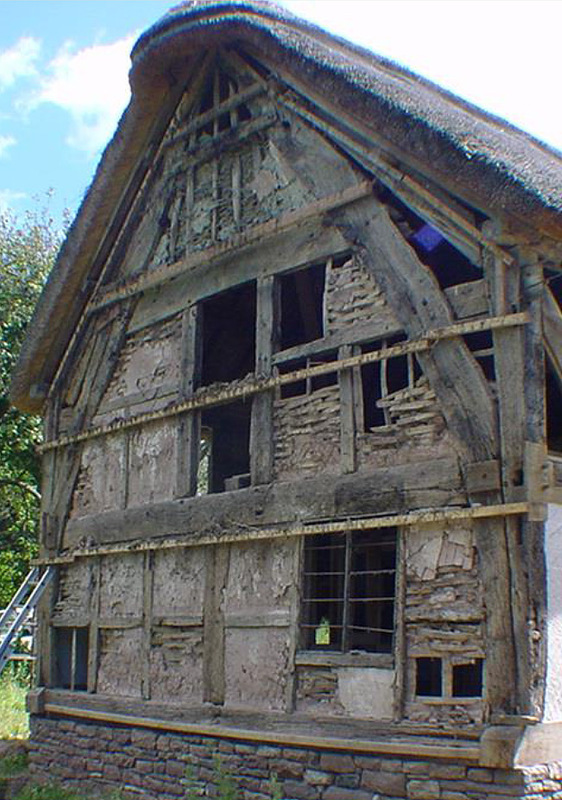 In theory, the overhanging thatch should have shed much of the rain, but owing to the considerable inward lean of the north wall, water coursing down the face led to rapid weathering of the panels. 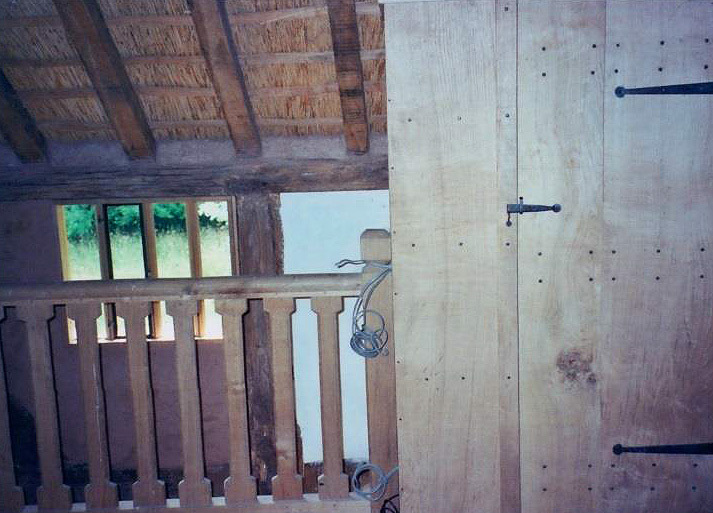 Pentice boards (horizontal boards set at 45 degrees to the wall) were added in 2011 and have given improved protection from the weather. The intensity of colour changes with the weather. 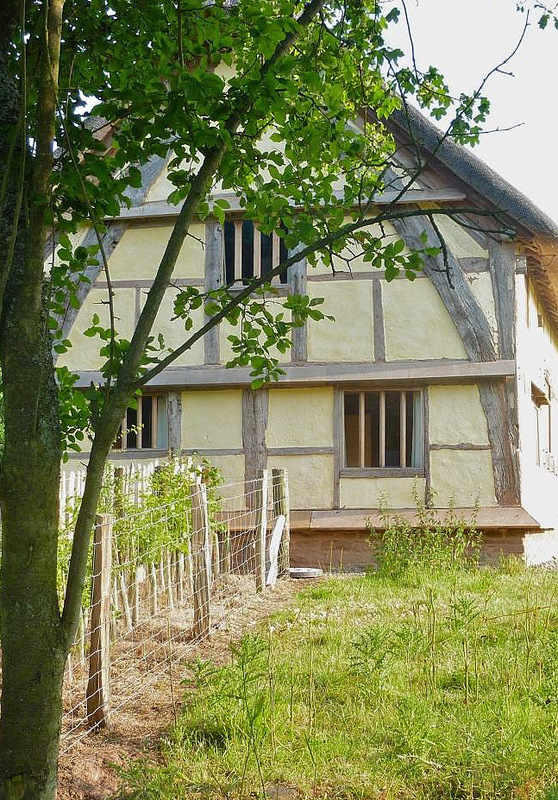 The lime wash is permeable to water, so darkens as it absorbs moisture and lightens as it dries out. 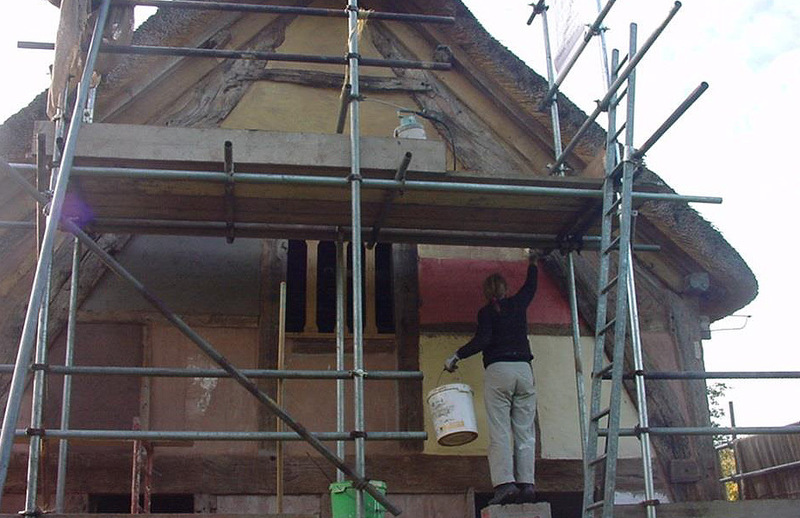 The left of the building has just had a coat applied; it will dry to the colour on the right but revert to the darker when it is re-wetted. 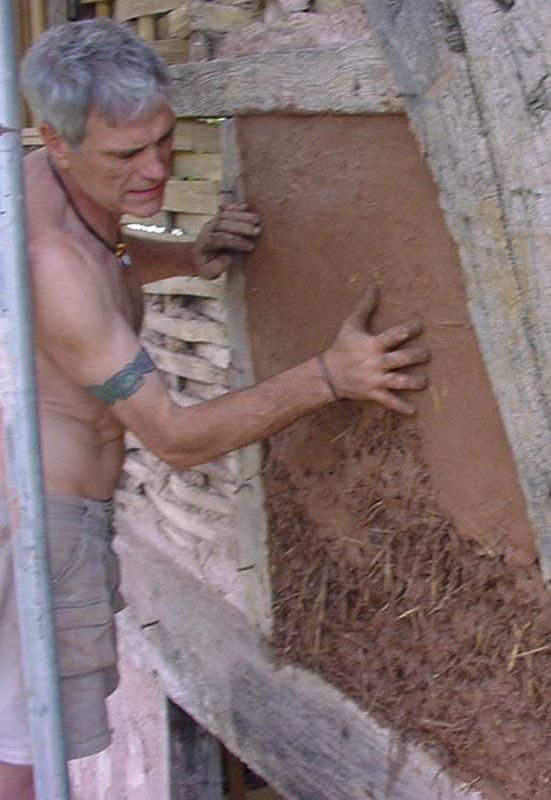 Similarly, the lime plaster allows the passage of moisture, so while panels become temporarily damp they quickly dry out so no water becomes trapped in the structure. Nick, fitting a window. All windows that weren’t part of the original building have been made as simple diamond mullions, excepting the leaded light next to the chimney, which had one of that style before the move. So as not to disturb the face of the building, the blacksmith made small casements which fit between the mullions and open inwards; perhaps not the most practical but very pleasing. 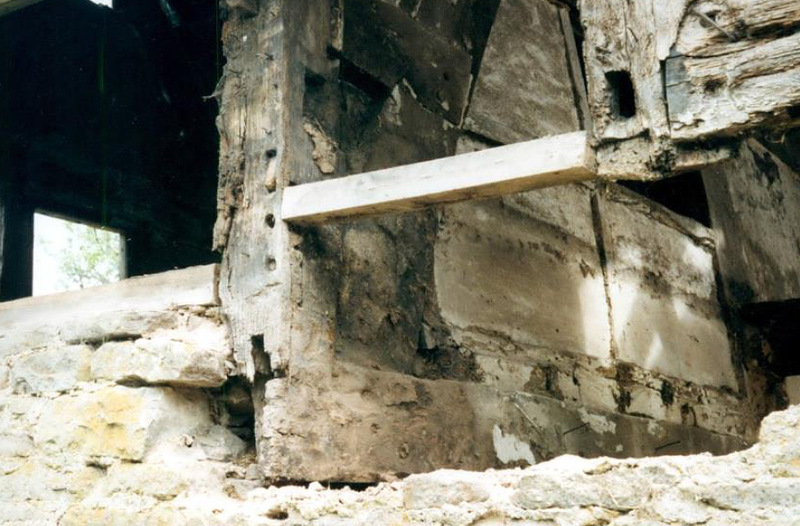 One of the three original windows, shown [above right] with a hessian cover protecting the lime plaster while drying. With no glass, the effect of an animal skin draped across the opening may not have been too dissimilar. After much deliberation we chose to use a non-reflective float glass for glazing. When perfectly clean it can be quite disturbing as there appears to be no glass. Guided by the architect, engineer, historical precedent, building regulations and pragmatism, the interior joinery evolved. At no stage did we set out to create a museum piece. 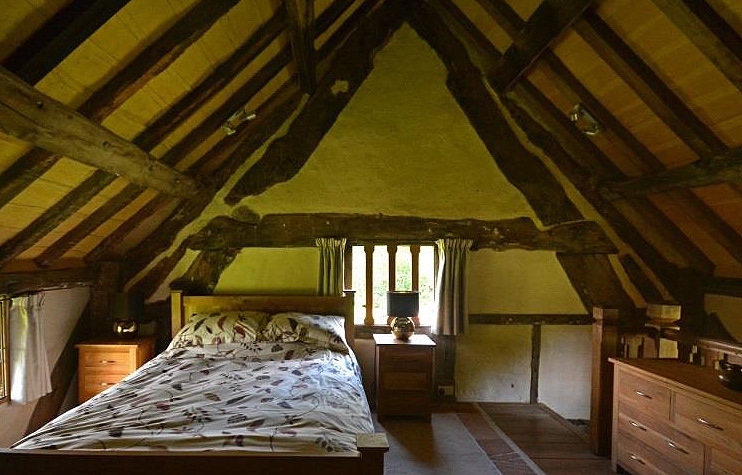 Rather, the object was to retain the atmosphere of the medieval hall brought into the C21st. We wanted to extend the life of the building, give it a future, rather than fix it to one point in time. Every possible position and style was considered for the kitchen. It felt wrong to position anything against the walls. That only left the place the high table would have once occupied, and it seemed fitting that again this should become the focal point of the hall. 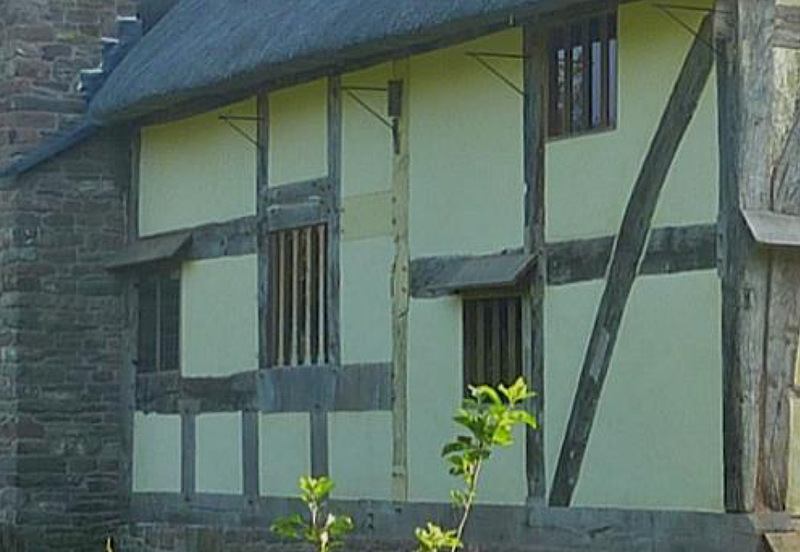 Timber for joinery was mainly off the adjoining farm or sourced locally. 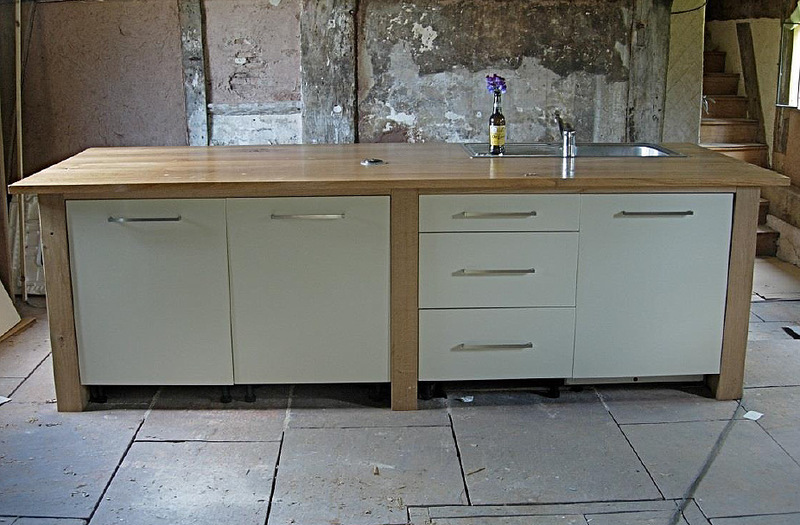 Machine use was kept to a minimum and all surfaces hand planed so as to retain more ‘life’ in the wood; a time consuming process, but the end result is worth the extra effort. 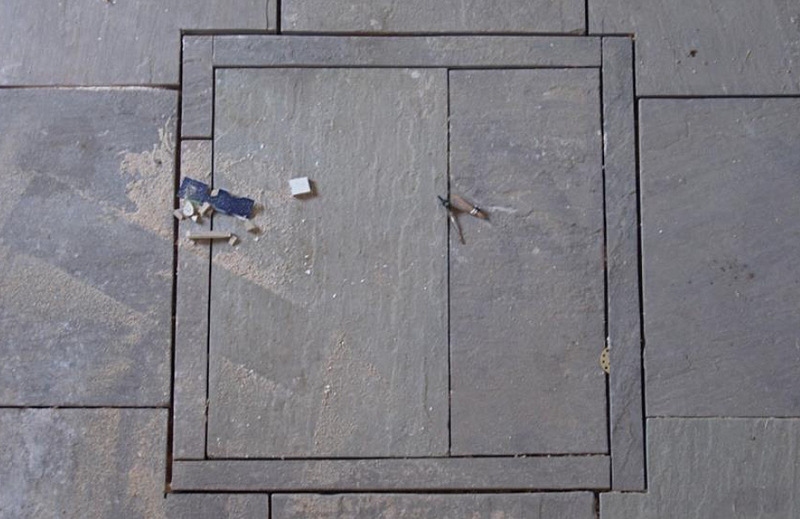 In medieval times the fire burned in the middle of the floor – now marked as a simple square in the flagstone floor. 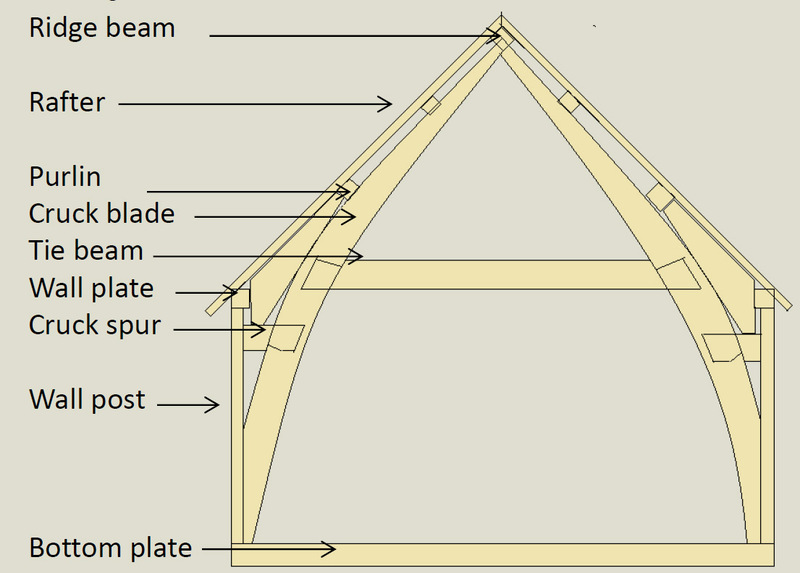 Directly above is a rafter with a half joint that stops short of the ridge beam. Here was the smoke hatch where at least some of the smoke vented out. 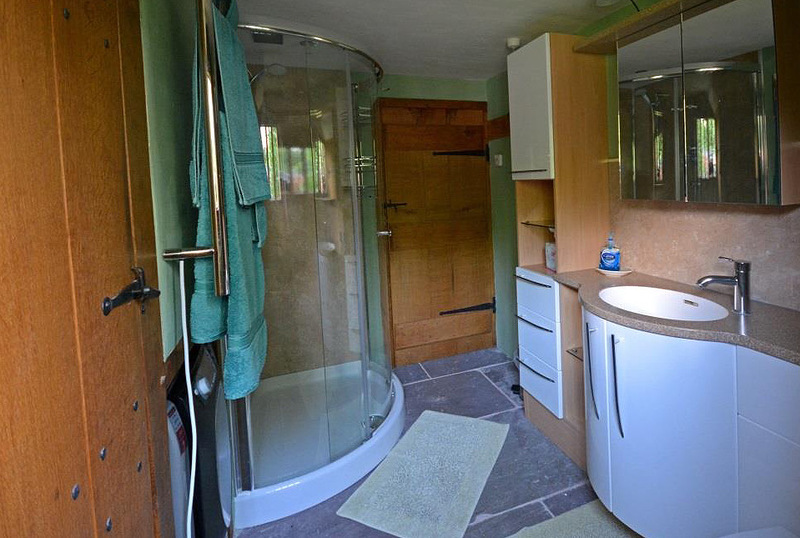 The heating of such a large, high and poorly insulated space posed a problem. In order to avoid heat generated rising rapidly into the roof space, we decided to create a huge thermal mass within the floor that would radiate heat out at a low temperature. 10” of blown clay insulation sits on geotextile matting, and above that is a 6” limecrete slab. Next, the heating pipes were laid, covered with a 3” lime and glass screed. This is topped off with 3” to 4” locally quarried flagstones. The whole is very effectively heated by a ground source heat pump. Such a large mass is slow to heat up, or respond to adjustment, so runs constantly in the colder months. A wood burner provides a boost and adds to the atmosphere; the two combined work well. 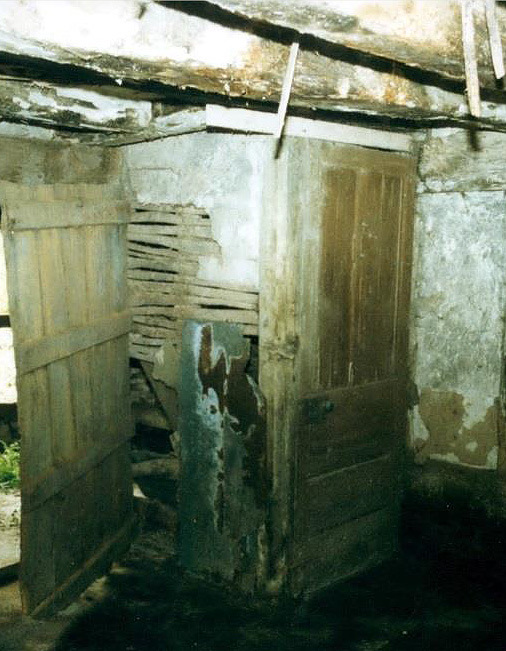 Obviously there was no precedent to follow as regards sanitation. 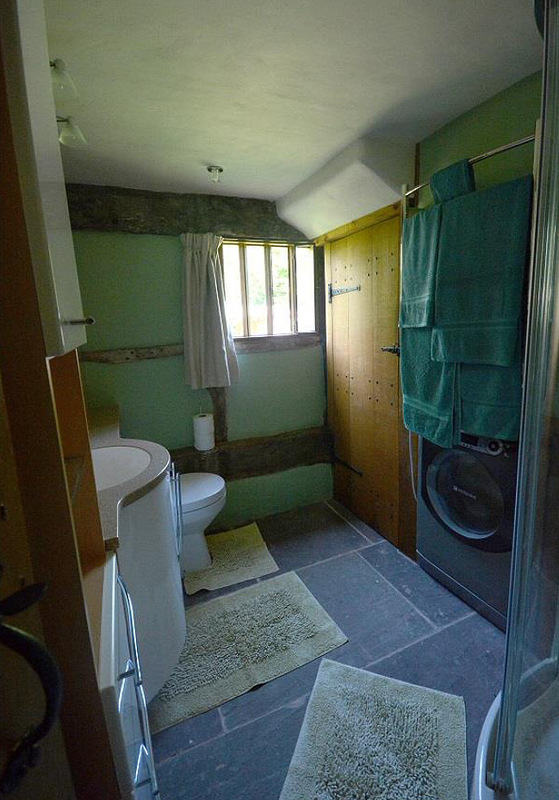 There seemed little point in putting anything other than a modern bathroom in. Similarly, lighting is modern, energy efficient and where possible, discreet. The wall between the bathroom and bedroom: two separate offset frames are within the one wall, insulated against sound with wool batts. 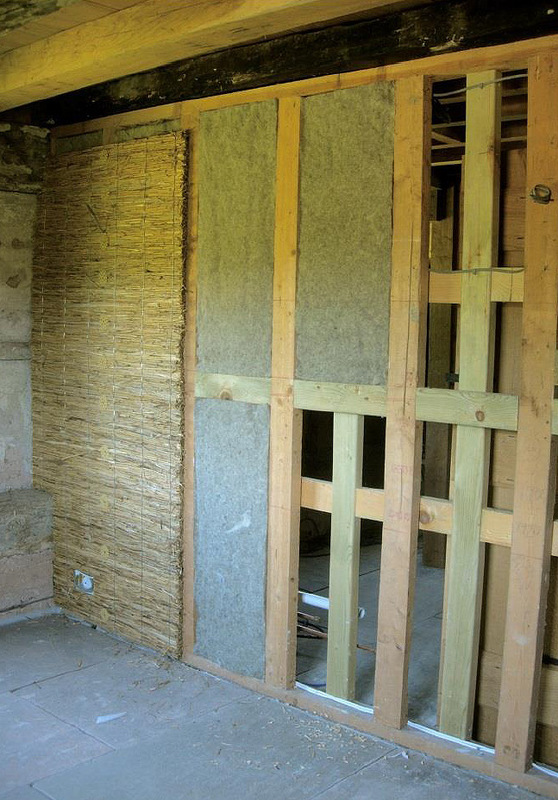 An inch thick reed board with three coats of lime plaster gives the look of age and further acoustic insulation. 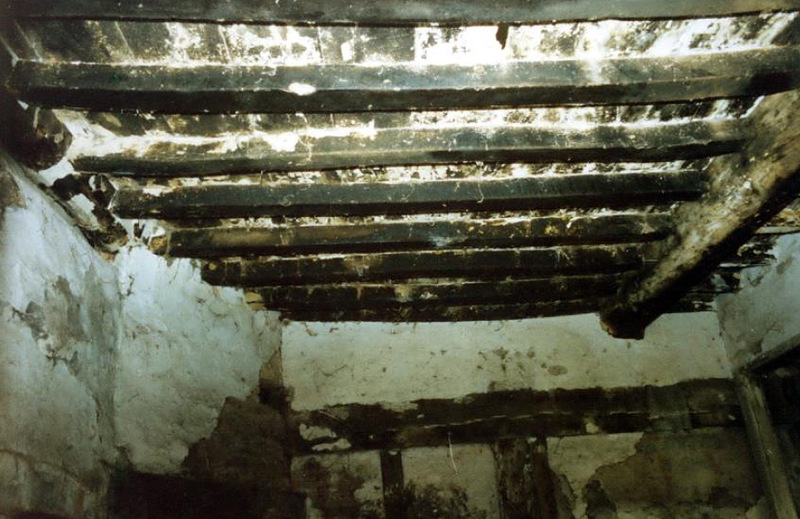 Rather than replace the lath and plaster that formed the ceiling, reed board was neatly fitted between the floor joists to minimise noise transfer between upper and lower floors. The view from the one missing panel in the cross wall was just too much fun to block off so we left it open and added shutters. 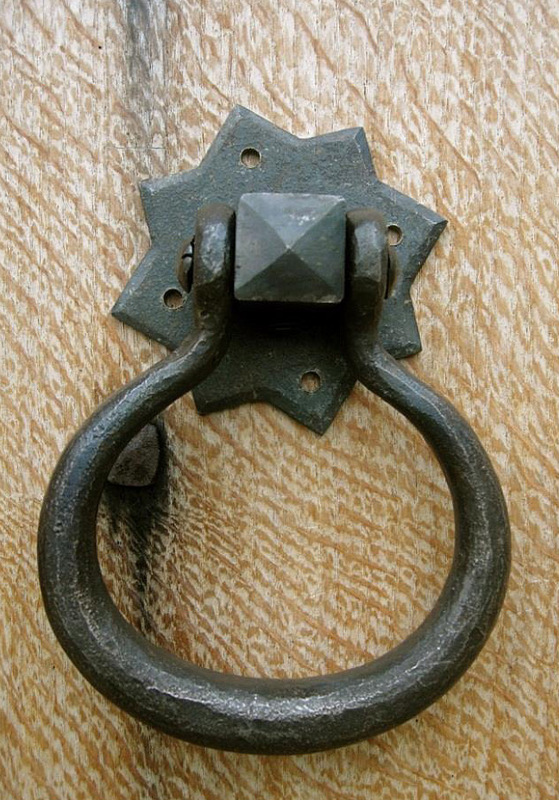 Ironmongery, including hinges, handles, window casements and even door nails, was made by local blacksmiths, Peter Crownshaw and Owen Mabbort. It wasn’t the intention to clean the timbers to the point of sterility but obviously it was necessary to take off some of the grime. 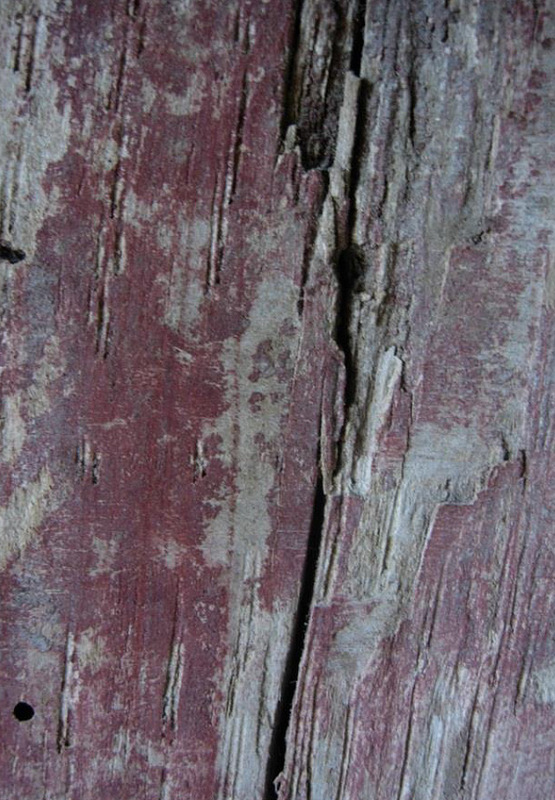 When cleaning the centre post in the cross wall, beneath the layers of dirt appeared this red ochre, probably dating back to medieval times. It is still there to be seen. The reed that didn’t lie tight on the battens was trimmed off, for the sake of tidiness, to minimise the fire hazard and to make cobweb removal easier. When the smoke wafted around the upper reaches of the hall it probably dealt with insects and spiders; now we have a 20ft long cobweb brush. Before and after: the cross frame looking south from the solar/bedroom side. Before and after: the western side of the solar. Before and after: solar/bedroom looking north. Before and after: solar/bedroom looking east. 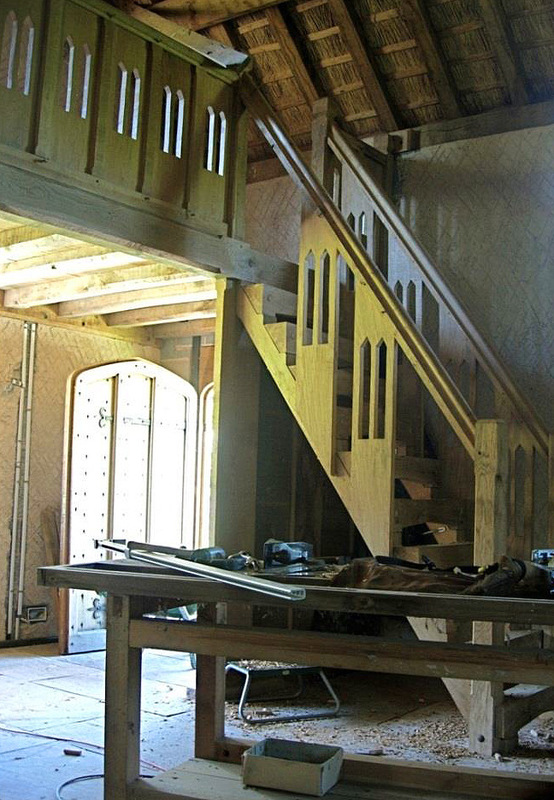 Before and after: the staircase to the solar. 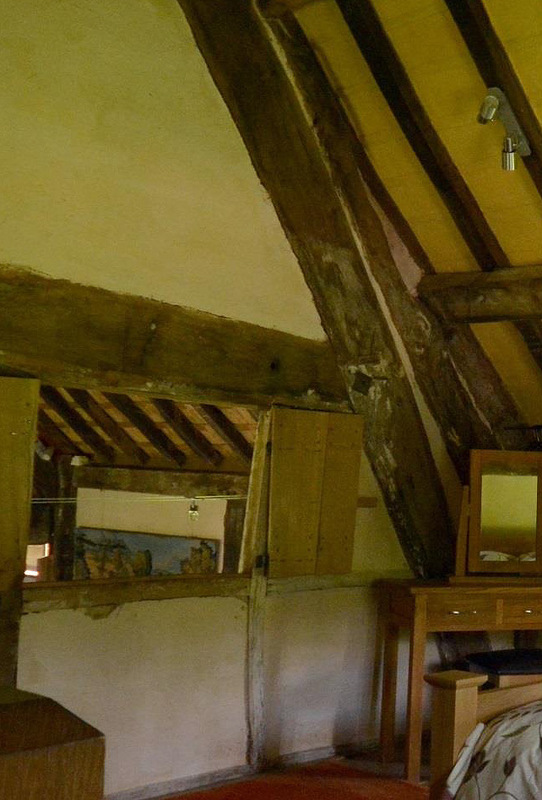 Before and after: the parlour/bedroom looking south. 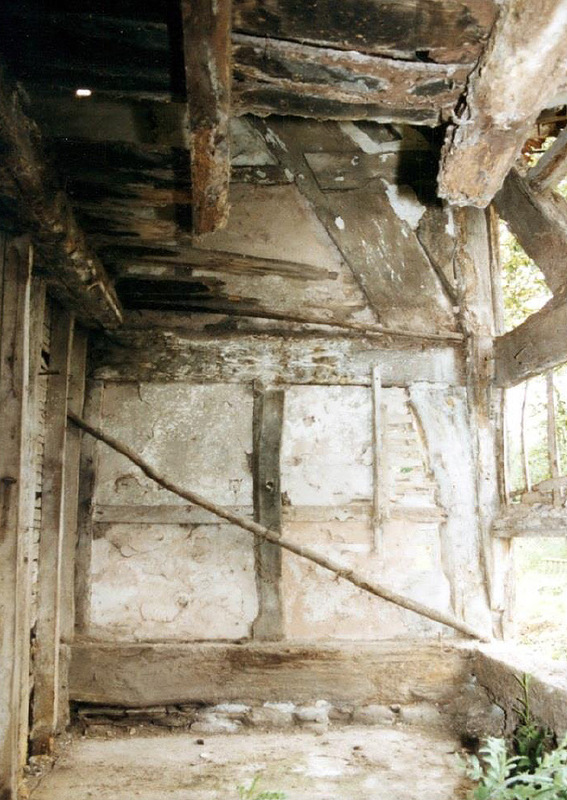 The fireplace obscured where the bottom of the cruck blade would have been. Before and after: the new doorway into the bedroom below is in the same position as the old one that accessed the stairs to the solar. 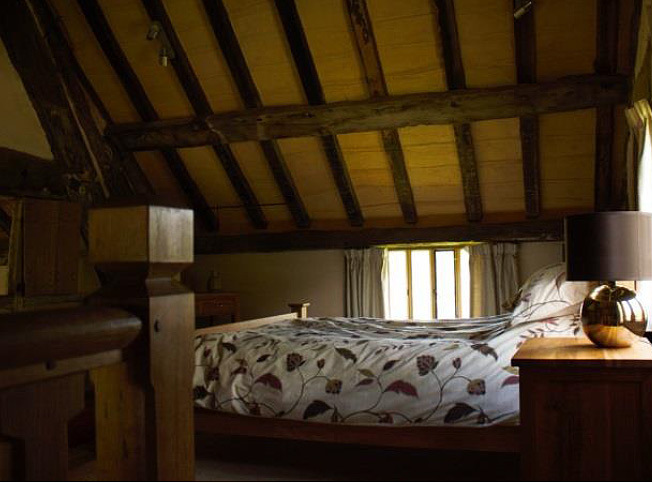 Before and after: parlour/bedroom. While we could have stayed with metal casements in the window, in the same elevation we had an original wide mullioned one in the solar and a diamond mullioned one in the bathroom. 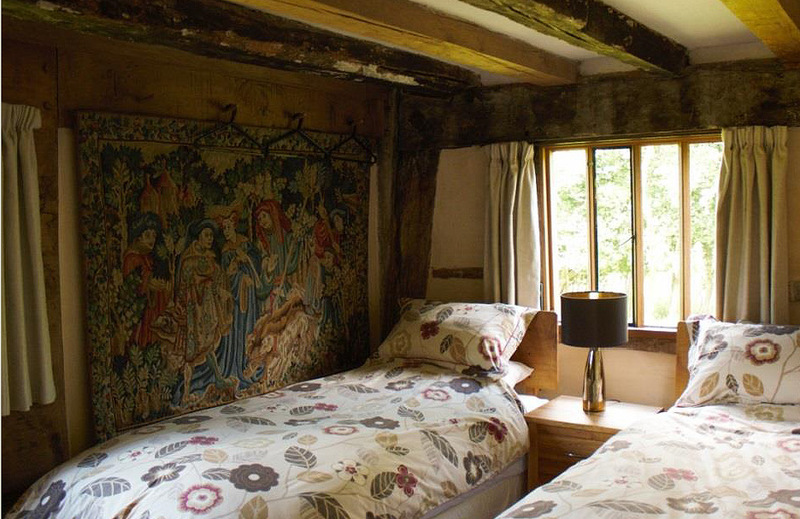 The curved arch brace is hidden behind the tapestry. Before and after: the cross wall, high end of the hall. Before and after: looking through the centre bay truss to the low end of the hall. Before and after: north elevation. Before and after: east elevation. 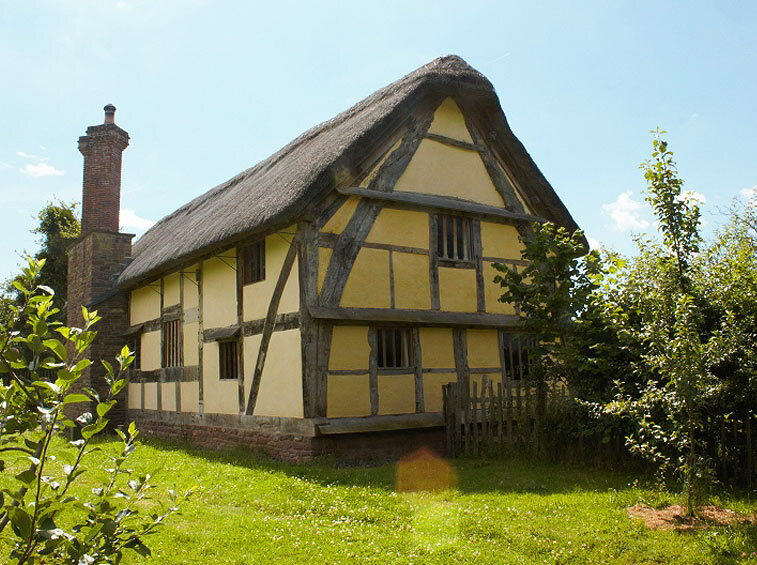 The moving of Hacton Cruck has allowed the building to be taken backwards towards its roots, yet at the same time it has moved into the C21st century. If it had remained on the original site it would have been a relic to the past, a part of a medieval hall house that had seen better days. 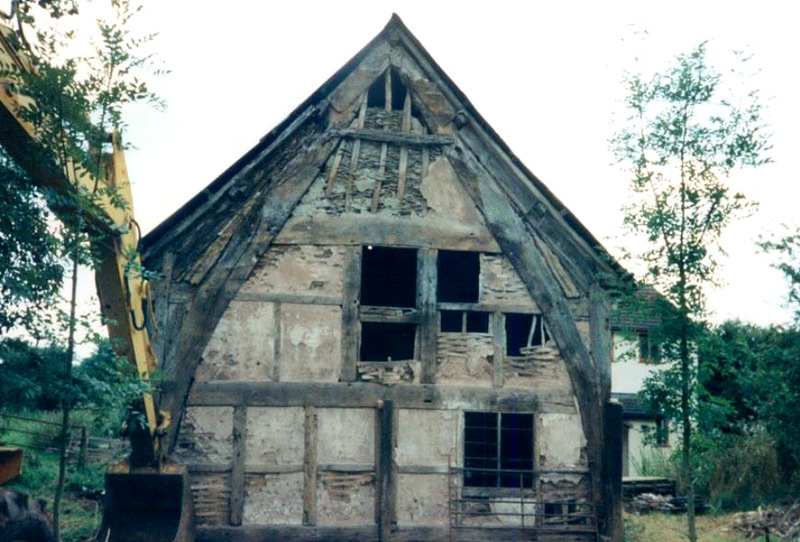 The social history of Hacton Cruck remains a complete unknown. No records have been found before the 1861 census, when two families lived there. 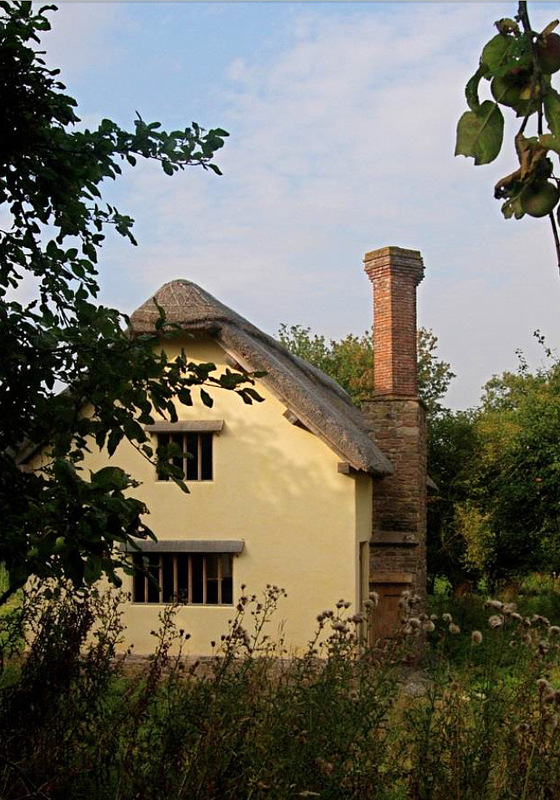 The lives of its occupants over 500 years are a blank; how they were affected by wars, plague or politics; why the village became a backwater; what caused the fall in fortunes that led to its division into two cottages. It’s all a mystery. 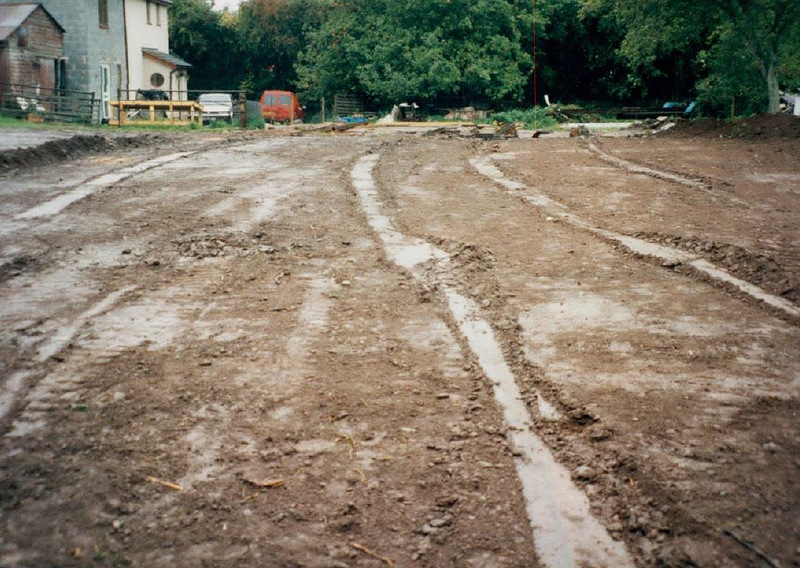 If the building had not been moved, the new foundations, floor and drains would have left nothing undisturbed. As it is, the floor and everything below it remain buried under a layer of topsoil. It is now a registered archaeological site. 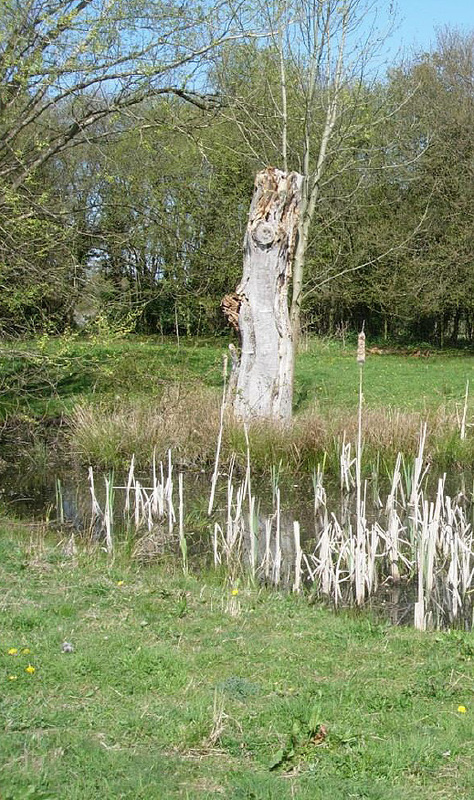 The pond may have been the source of the material for the original daub panels. We have since enlarged it. Several of the apple and pear trees around the property have gone since we started the project, including this lovely New York Pippin, one of four that blew down in 2010. While the stump remains, replacements were planted in the spring of 2011. 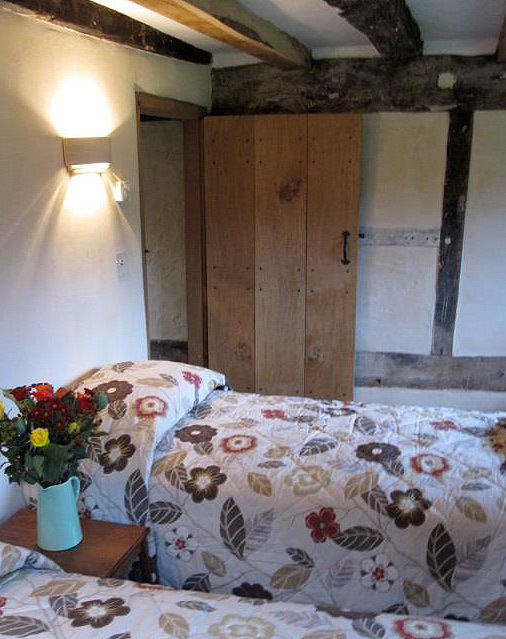 The most recent changes to Hacton Cruck were completed in May 2011 when it became available as a holiday cottage. After so nearly being lost altogether, its future is now secured. More than a museum piece, it continues to live, its integrity intact, perhaps more so than if it hadn’t been moved. 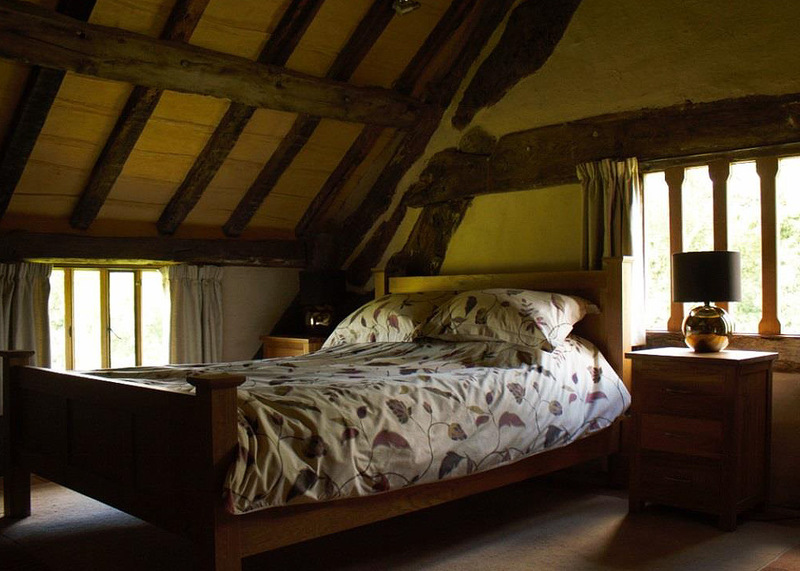 I continue my involvement with The Cruck while living in New Zealand by handling bookings. Dilys has a long association with the building too, as going back thirty years it was her garden shed. 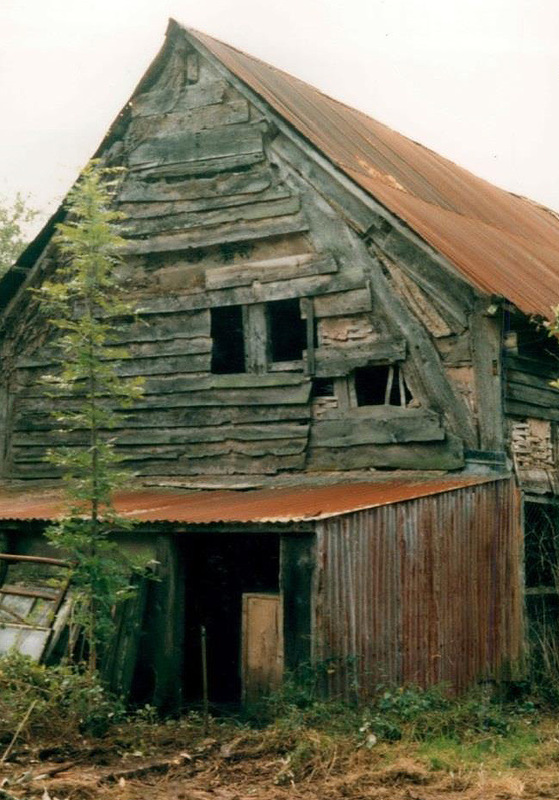 When the building was moved Dilys moved too, figuratively speaking, and took on the role of de facto caretaker. Now she is host, housekeeper and custodian. The idea of creating a record of the restoration was very much an afterthought. 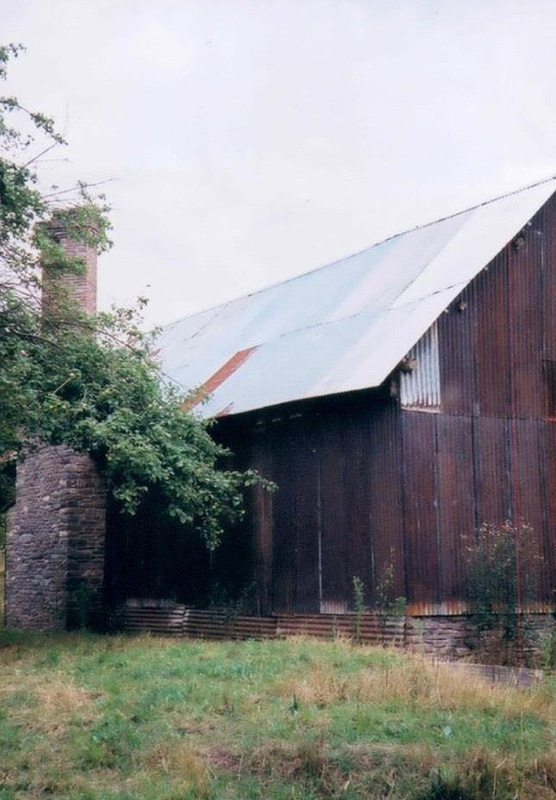 It was fortunate that Robert made a detailed photographic survey of the building in order to create the repair schedule. Jacqui, taking her own photographs for design purposes, recorded progress on the repairs to the frame and of the construction of the new bay. Friends and family members took shots as and when they visited. 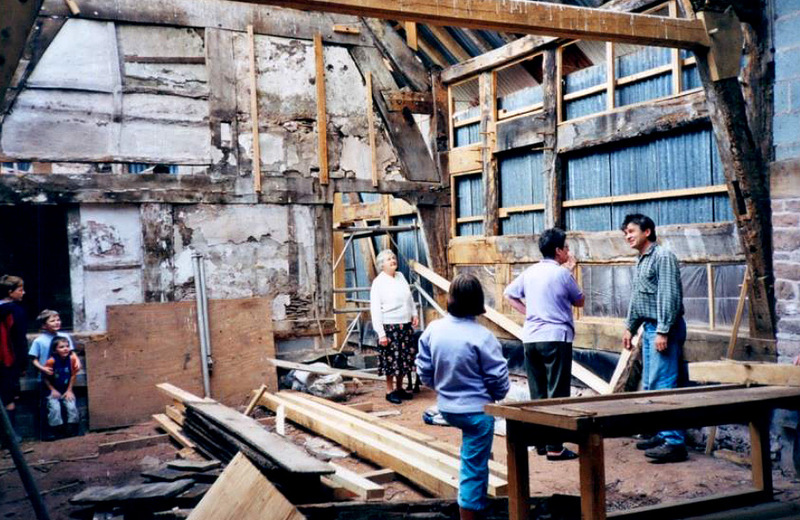 The moving of the building attracted all sorts of people, and a couple of videos were made, one of which is to be offered to the Herefordshire archives. 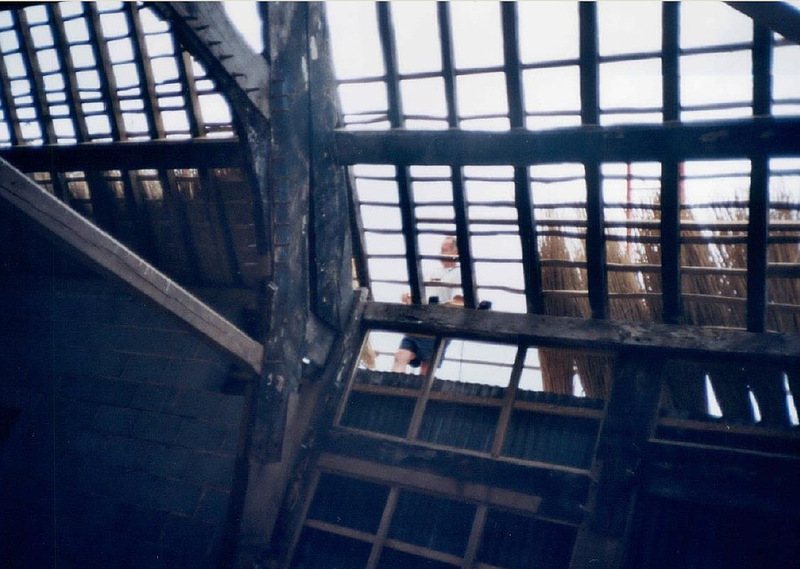 Once the corrugated iron was taken off the roof I was on site for most of the work but hardly took a picture, so the thatching was poorly recorded. The plasterers supplied us with their images, the first to be digitised. Ian was more thorough and photographed most of the finishing stages. Avril and John appeared on the scene annually so we have their input. Jeannette recorded the kids on their visits.